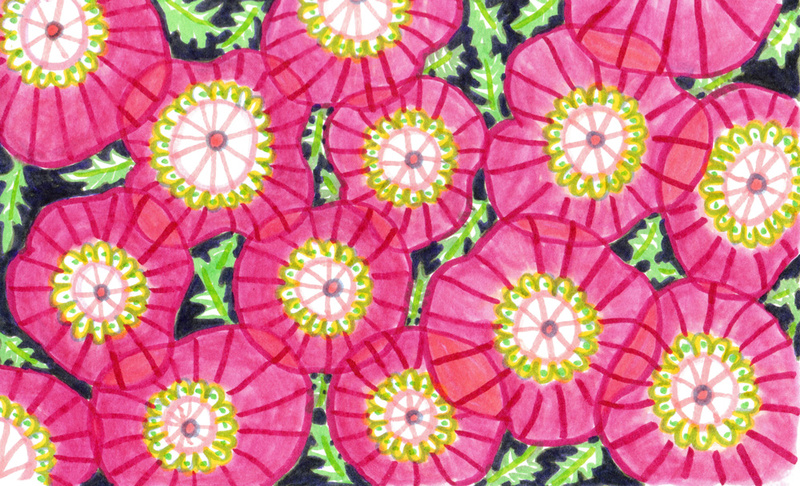 From the Sketchbook: More Poppies! 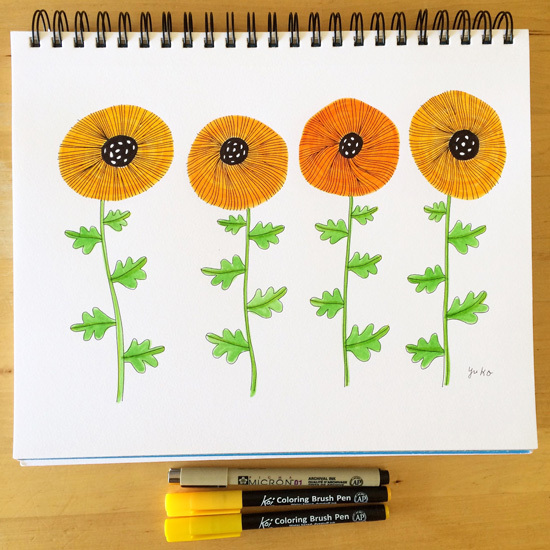 Last time I shared my drawings from my sketchbook, I was obsessed with drawing poppies. I’m still really into drawing them and wanted to share my recent sketchbook pages today! These colors really make me happy. 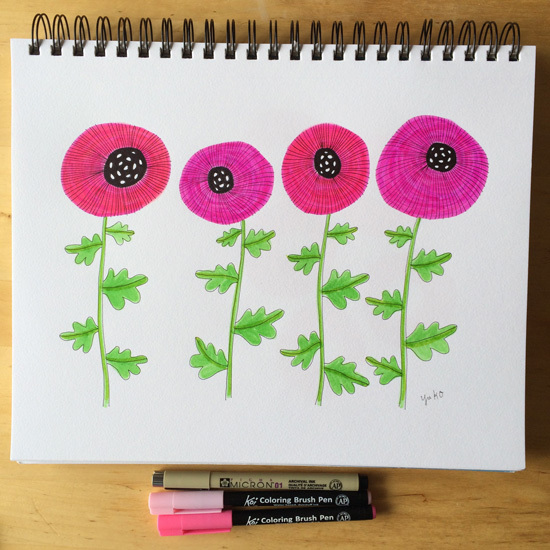 Most of my poppy drawings are done with Micron pen and Sakura Koi brush pens! 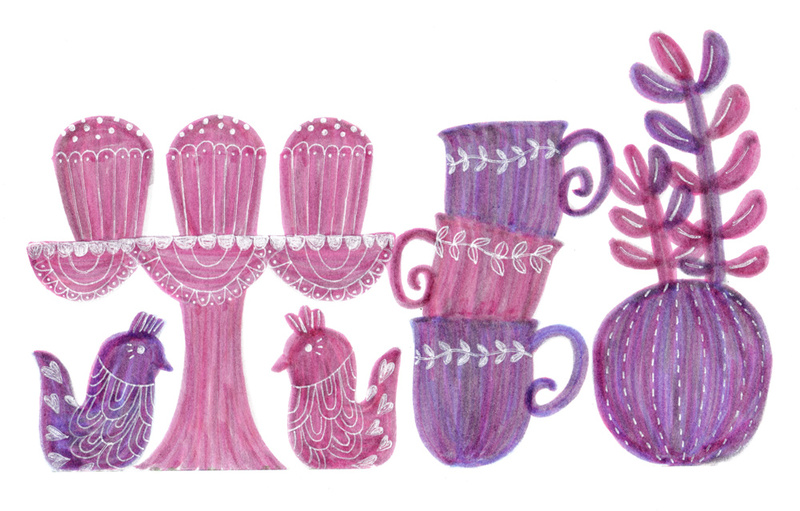 Love this pink and magenta combo! I also tried more cooler colors. 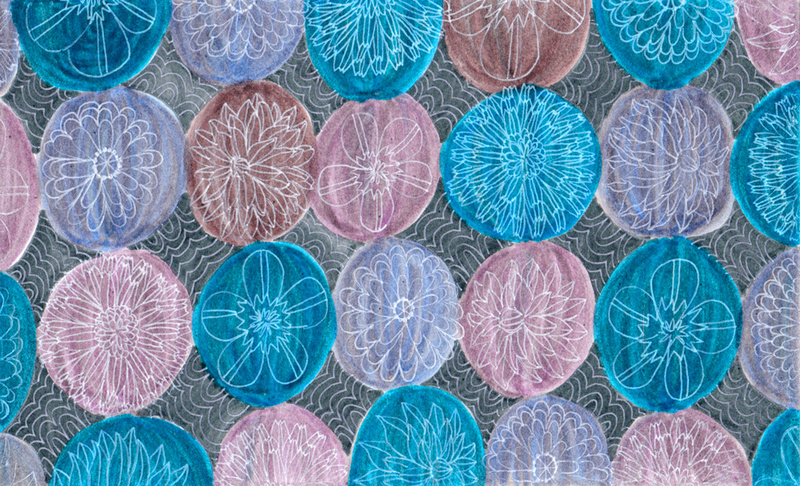 This one with Micron pen, Koi pens, and white Gellyroll pen. 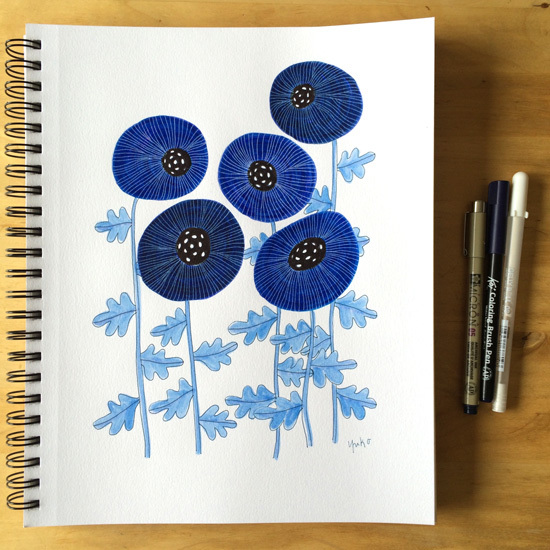 Darker blue poppies turned out pretty, too. 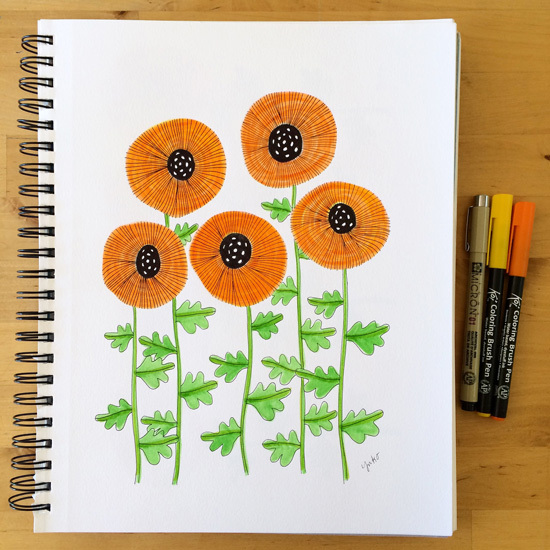 And, if you want to learn how to draw these fun poppies, you’re in luck! 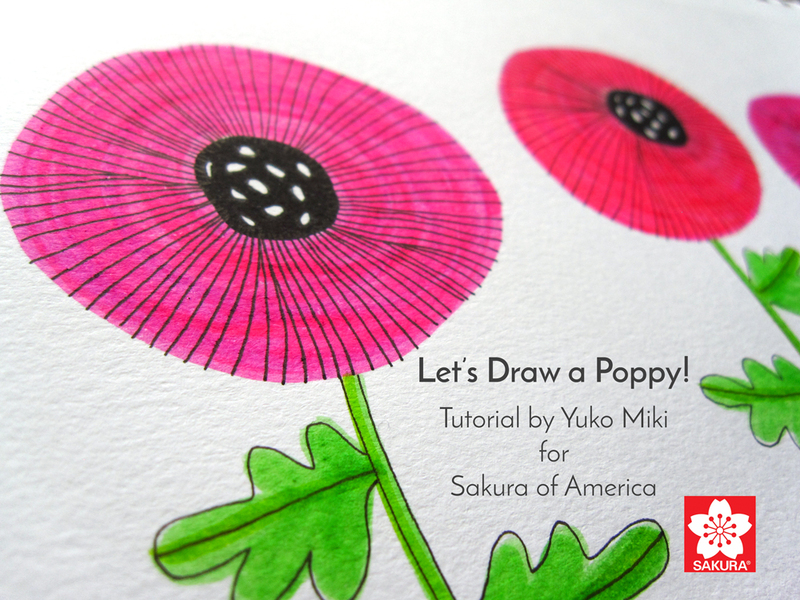 I recently made a video tutorial for Sakura of America, and this FREE video will be available on their YouTube channel soon! I enjoyed creating the tutorial and suspect there will be many more in the future 🙂 I’ll keep you posted on when they’re gonna come out! Hope you enjoy it! Talk to you soon. I was on a black and white line drawing kick for the past couple of months. 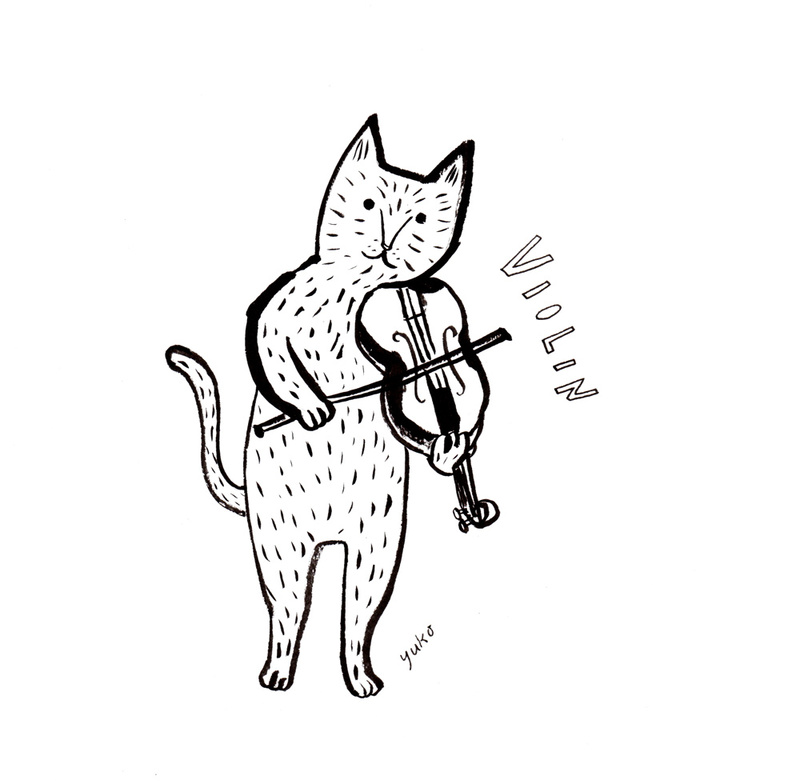 I just love the simplicity of line drawing very much. 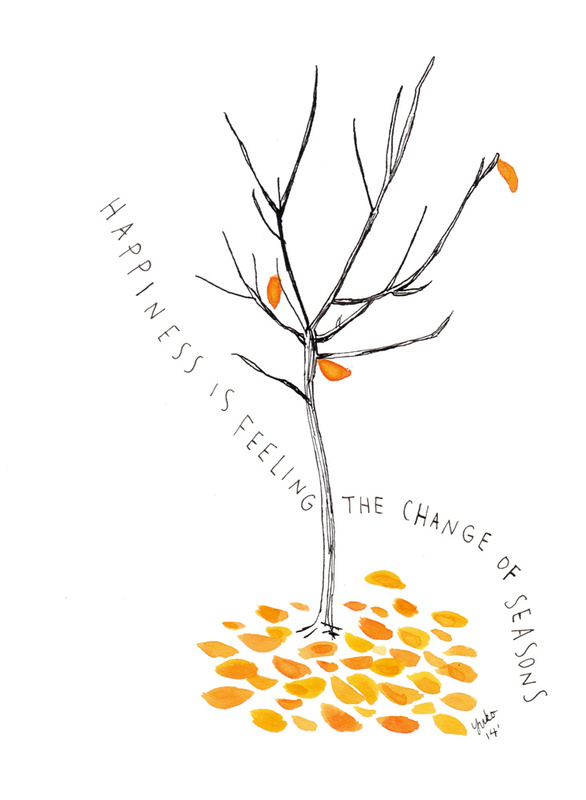 But it’s been feeling more and more like spring here, and I want COLOR! 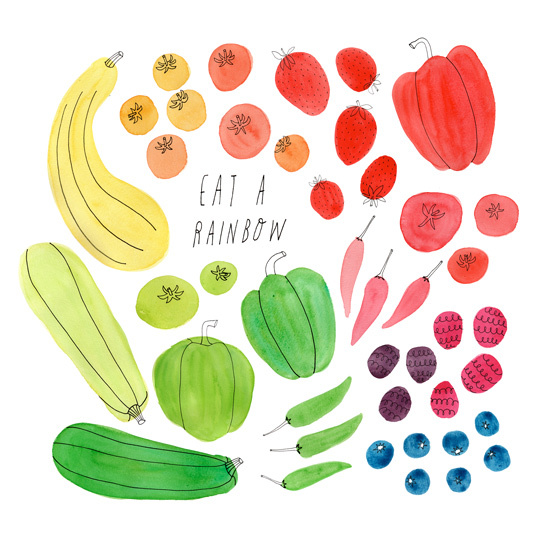 I can’t lie – colorful drawings make me happy 🙂 Do they make you happy, too? 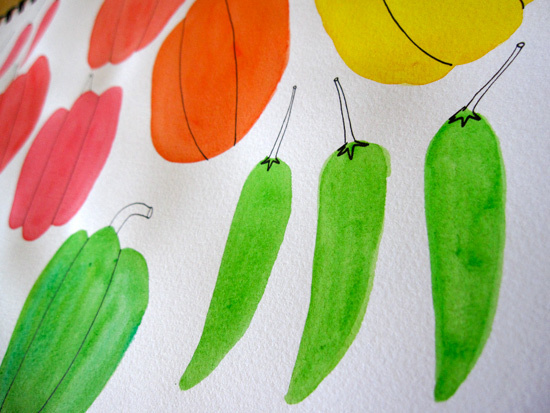 Peppers in watercolor and pen. 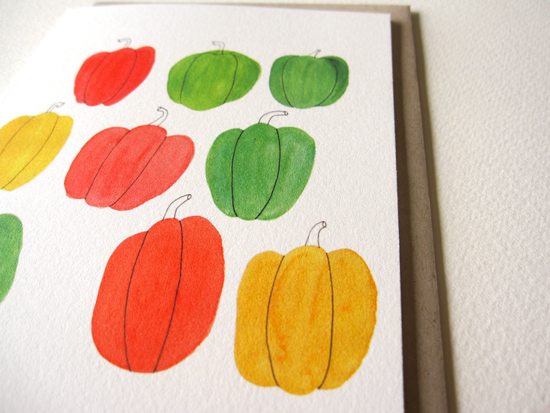 Some of the bell peppers look kinda like pumpkins… Oh well. I like them all! 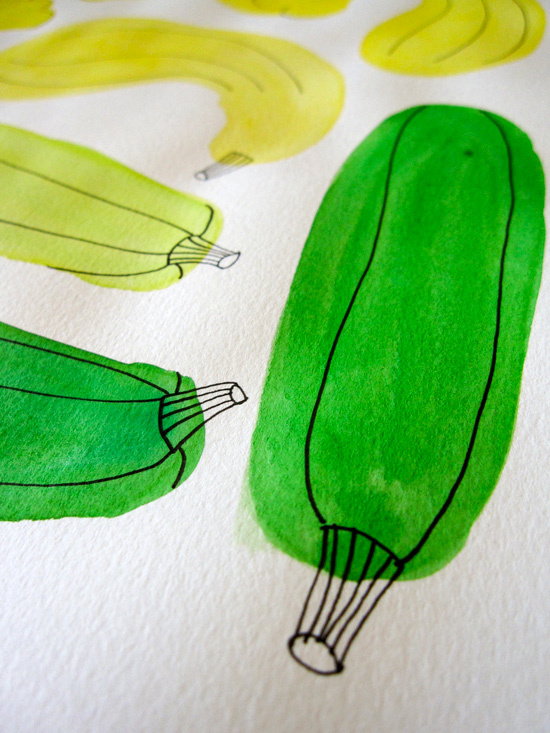 Summer squash in watercolor and pen. 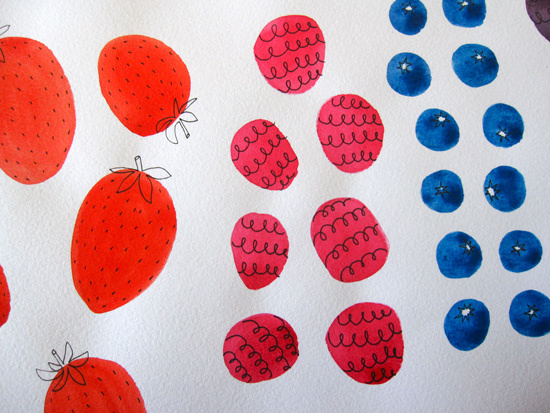 I draw the shapes with watercolor and brush and add lines with my Micron pen when the paint dries. 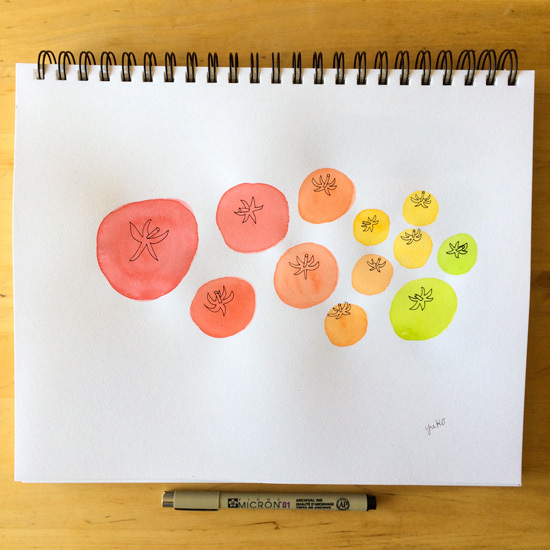 Tomatoes in watercolor and pen. 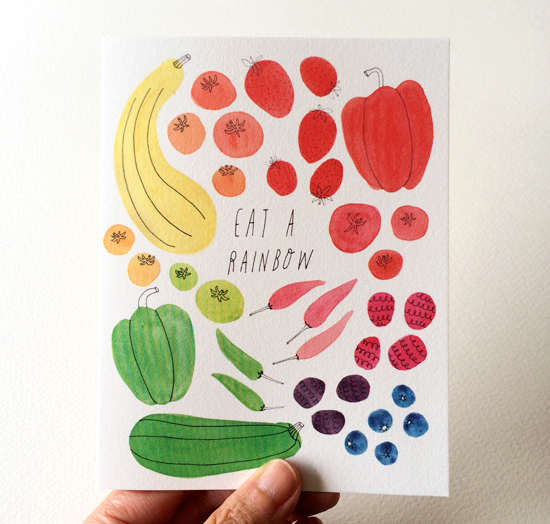 Rainbow Swiss Chards in watercolor and pen. Daffodils in markers and pen. I saw beautiful daffodils on my walk around the neighborhood one afternoon. I love their cheerful colors. 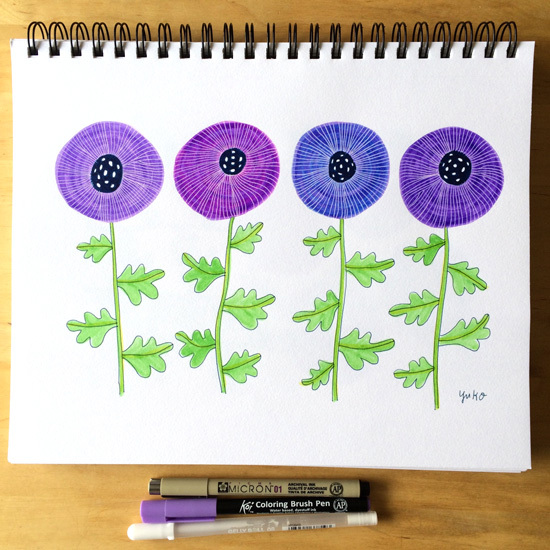 Purple crocuses in markers and pen. It made me happy to see many crocuses on the sidewalk during my walk. 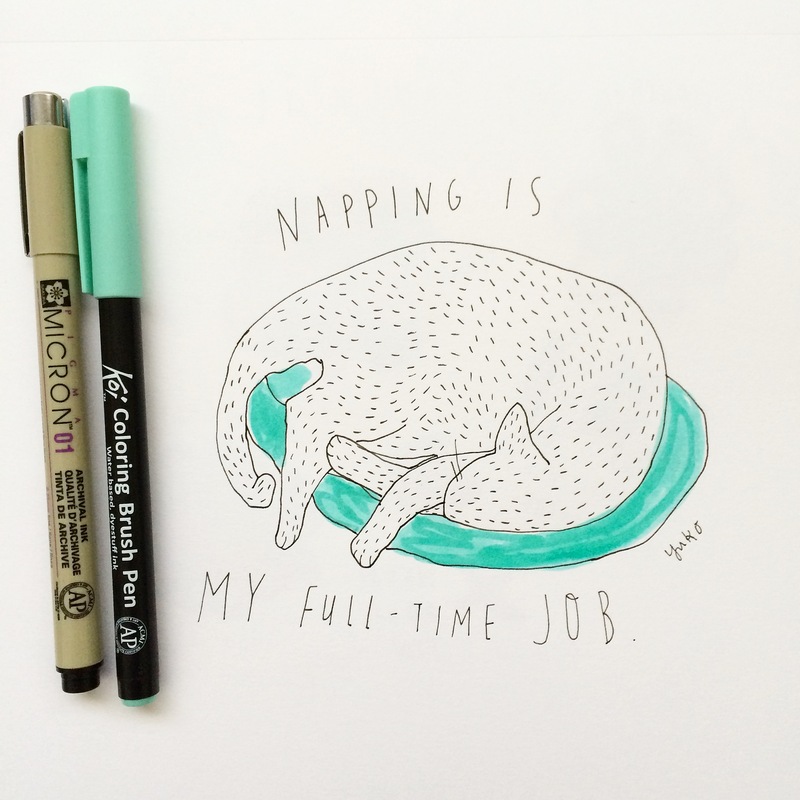 Napping is My Full-Time Job in pen and marker. I love how cozy he looks when he’s taking a nap…makes me want to curl up next to him in a giant cat bed! OK, I hope you enjoyed these drawings and have a wonderful Tuesday! Let me tell you what I did on my first sabbatical week. It’s so nice to be back from my mini sabbatical week! For those of you who haven’t heard, I decided to take every 7th week off to step back from the day-to-day and recharge. I just had my very first sabbatical week the previous week, and it was really awesome! As promised, I wanted to report back and share how I spent my week off. To me, this was not a vacation, per se, but an opportunity to breathe and do something I don’t normally get to do. 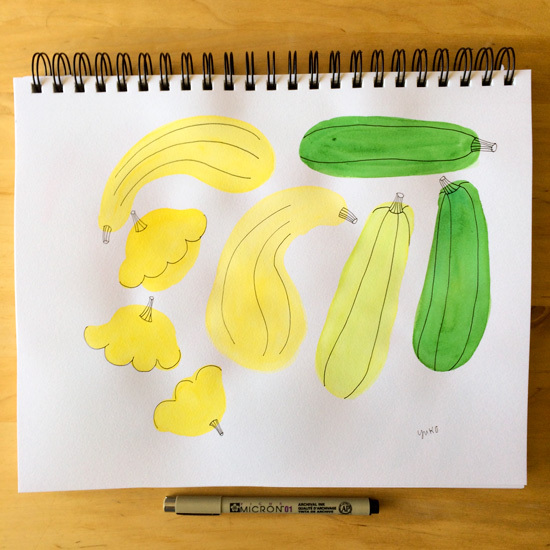 1) I created a new drawing tutorial. Some of you may have seen it, but I participated in a blog hop with Kelly Johnson of Wings, Worms, and Wonder on Wednesday October 7 as a guest blogger! I had always wanted to do tutorials, so I was excited and honored when she approached me to join her. She asked each participating artist to come up with a tutorial that inspires people to connect/re-connect with the nature. 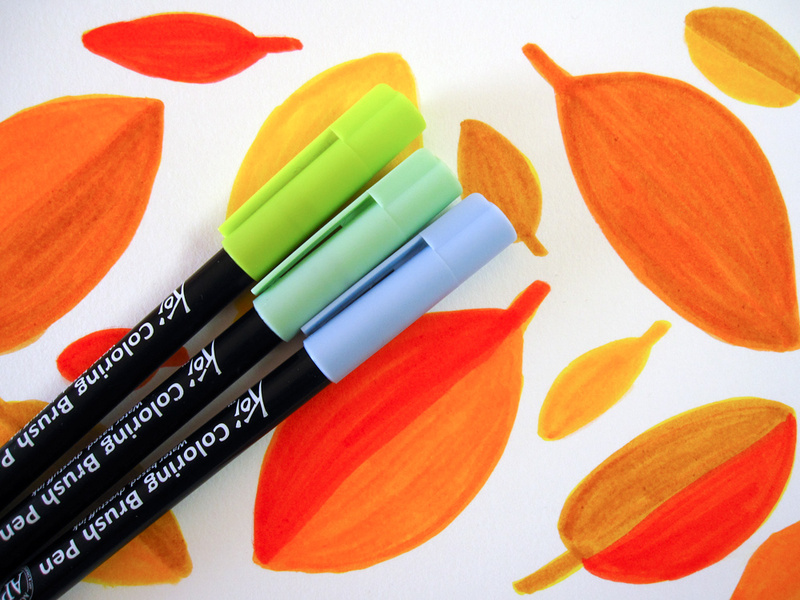 I thought about what I could teach people and decided to create this Fall Leaf Marker Drawing tutorial! 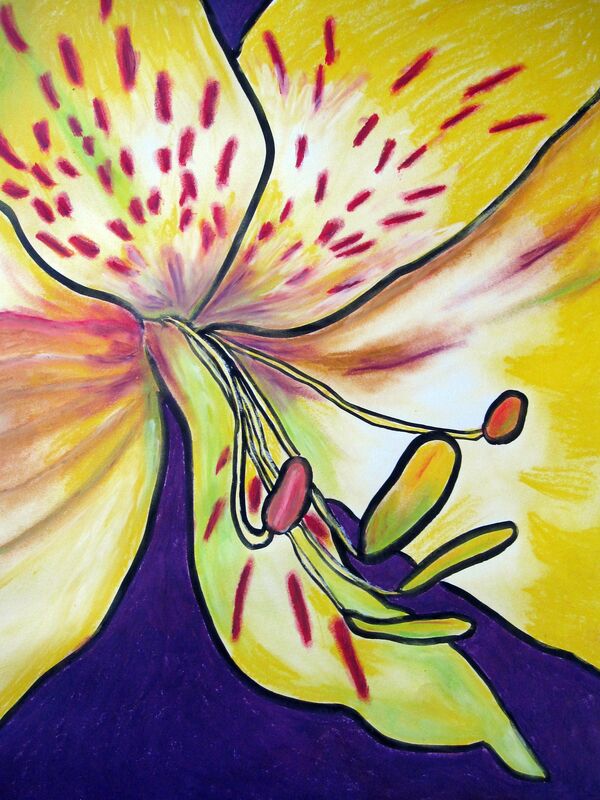 I’ve received positive feedback from folks that it was very accessible and inspired them to try marker drawing. I really enjoyed the process, too, and hope to create more tutorials in the future! I might have mentioned this here before, but I’m not that into cooking. I don’t dislike it but just don’t enjoy spending a lot of time cooking up some gourmet meals (that’s more my husband’s thing, which I’m very grateful for!) I enjoy eating simple tasty meals that are quick to make. 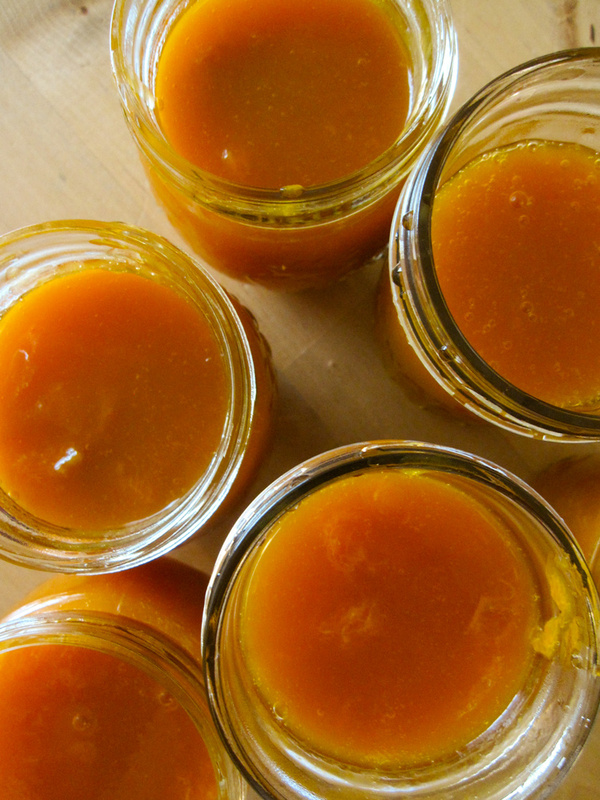 But there is something about non-regular cooking, like making jams, baking, and making fermented foods that I like. It might be because the process is fairy simple, and you get to enjoy the products over time? Canning and fermentation make me feel very empowered, too. 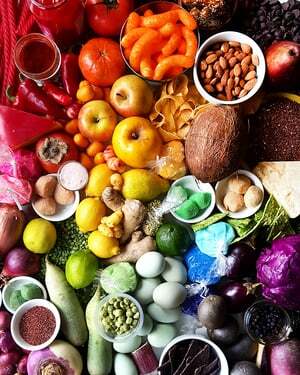 You can turn some fresh ingredients into things that last for a long, long time. Magical! I used to do these things more often before I got serious about my art business. Even though I’m not juggling a day job and art any more, I’ve been plenty busy and was feeling like I didn’t have the energy to do much else. 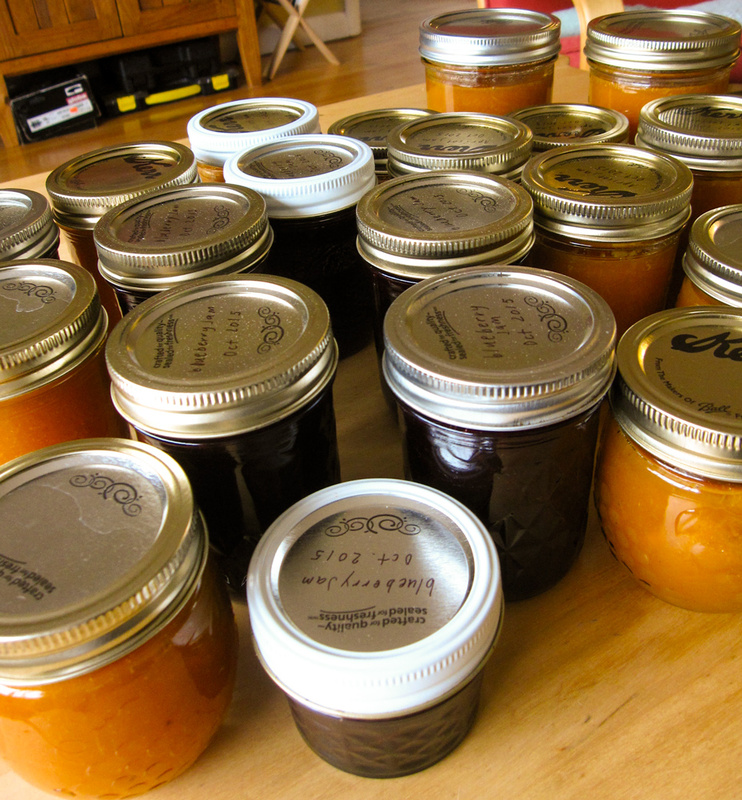 My husband had been asking me to make more jam because we were out for a while. So I decided to tackle that during my sabbatical week! 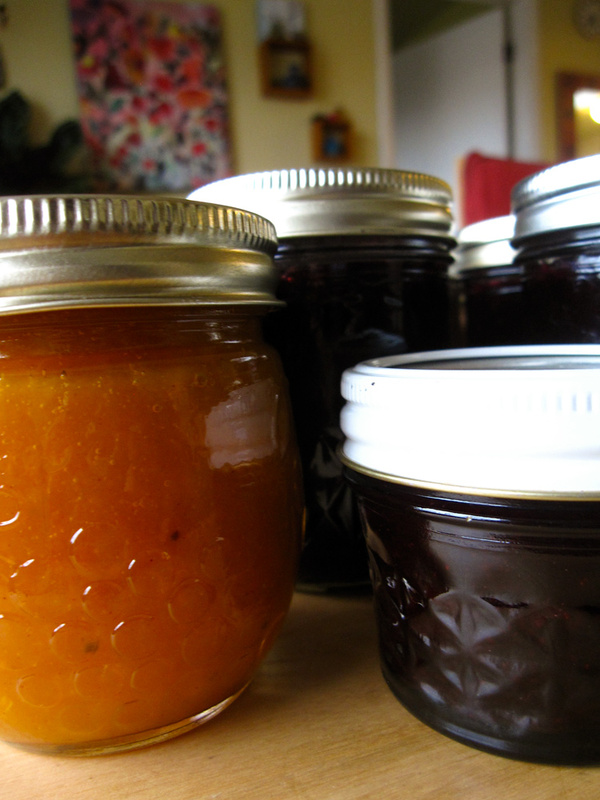 I made three kinds of jams this time! Our all time favorite blueberry, apricot, and I made a new addition, spiced apricot with cinnamon and clove. YUM. 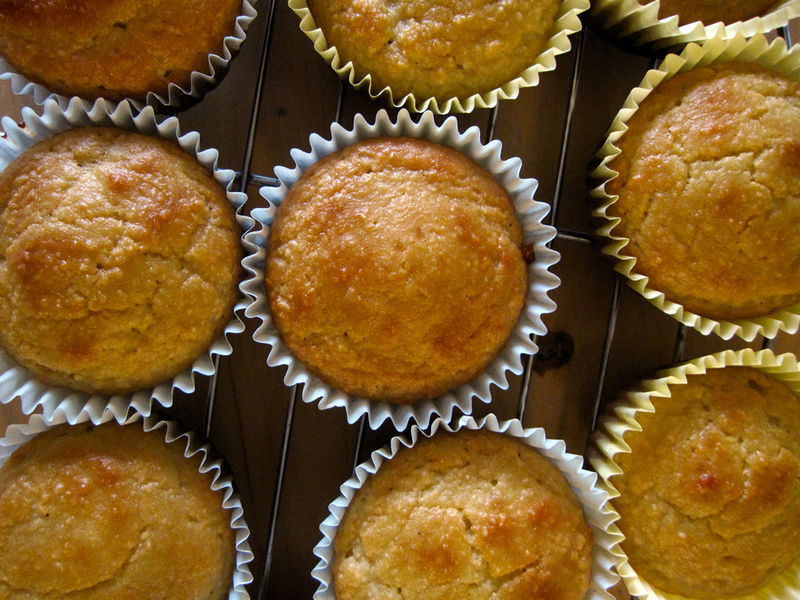 It’s kind of a long story, but I’ve been on an elimination diet of no grain flour for a while. But after making so much yummy jam, I really wanted to have something to eat it with. 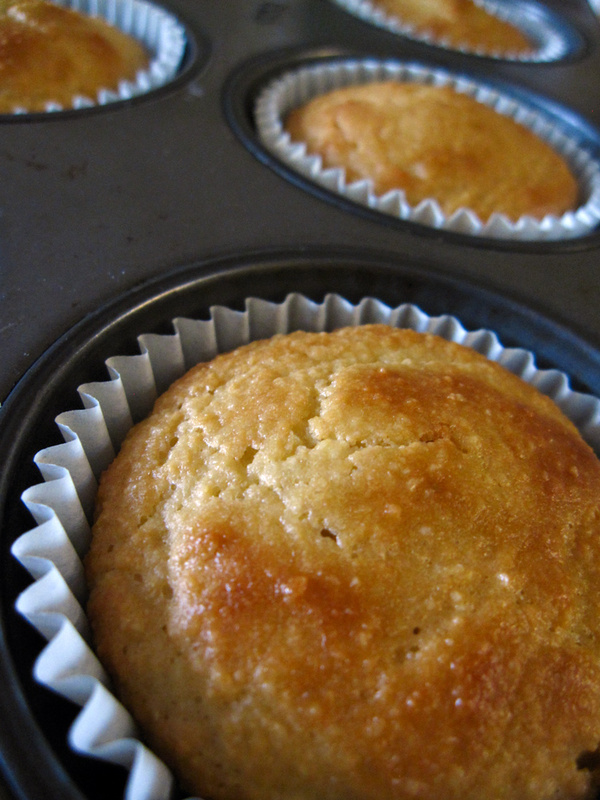 So I did some research and found this easy almond flour muffin recipe! It was really quick to make and was delicious! 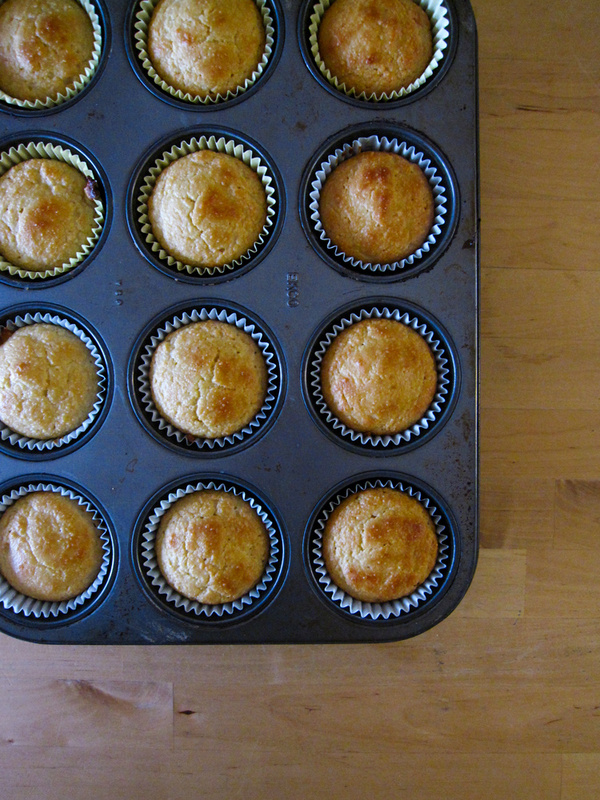 It has a nutty, earthy flavor, and the texture is very similar to cornbread. It went really well with my jam too! And I just generally spent more time cooking during the week. I love to eat and am happy when my creations turn out yummy! 3) I made art for fun. I still make something every day, but nowadays I spend much less time making art just for fun. 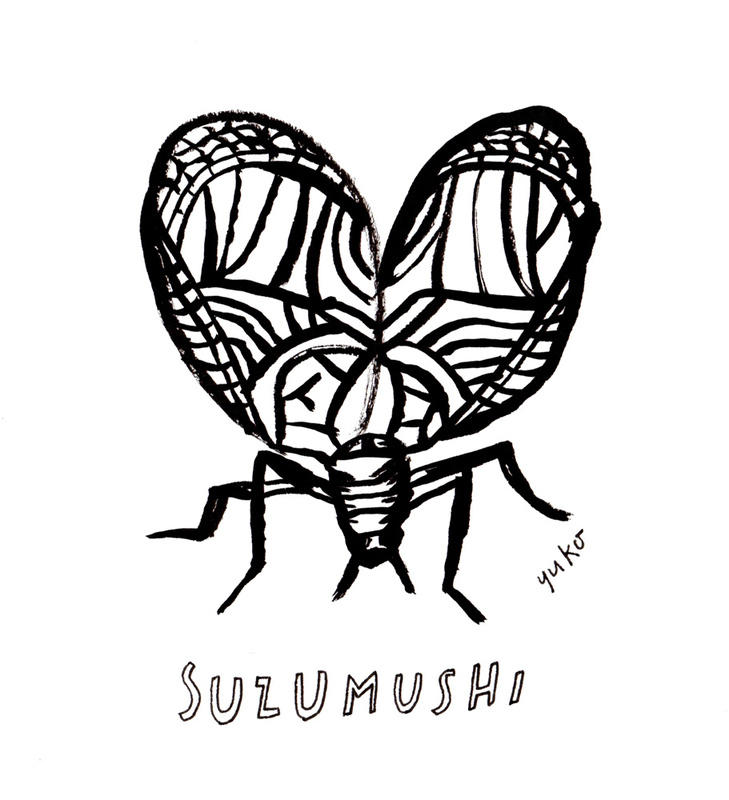 During the sabbatical week, I tried to turn off my work mode and doodled my little heart out. Here are some of the drawings I made! Aren’t these fun?? As I shared in this blog post, I always get new inspiration and fresh ideas for future work when I’m playing around. I had a few dates planned with my friends but ended up having just one for one reason or another. 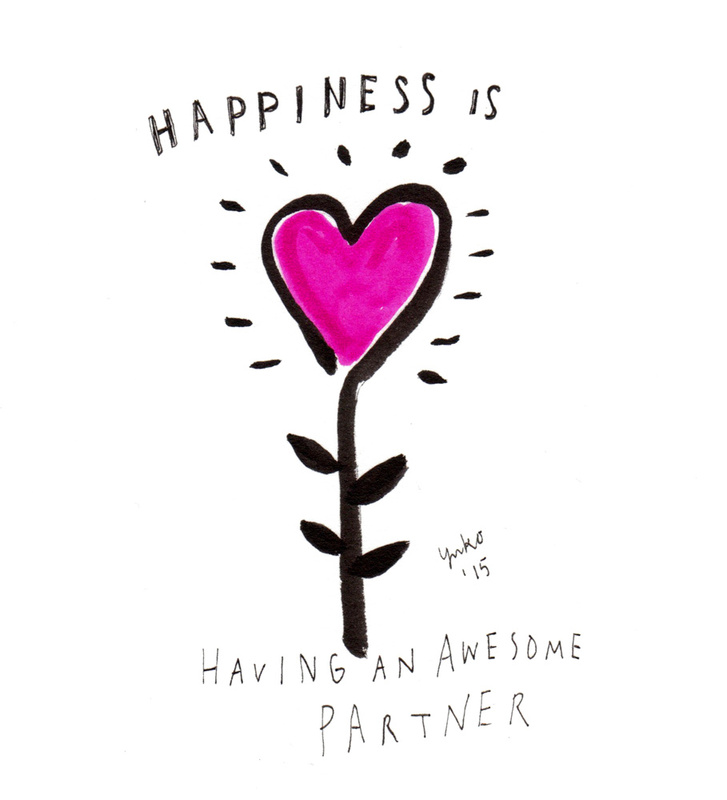 It worked out fine because, well, I’m an introvert and I recharge by being alone 🙂 My husband was away for work for a few days too, so it was a good balance between having a nice quiet time alone and hanging out with him when he was home! 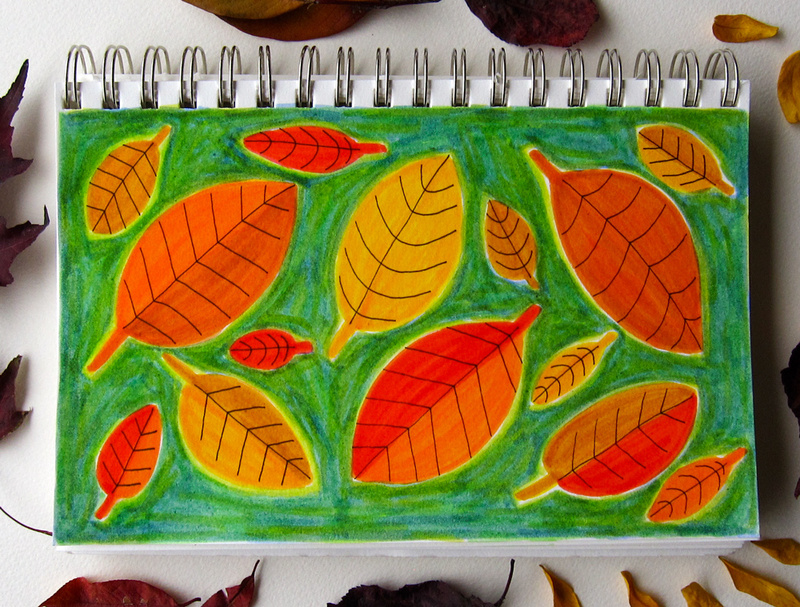 Draw Yourself Back To Nature Blog Hop Day 3: Fall Leaf Doodle Tutorial! Hi everyone! Welcome to the special edition of my blog post today! Those of you who’ve been following me know that I usually post an article about creativity and motivation every Sunday. Even though I’m on a mini sabbatical this week, I get to show up for you twice… How cool is that? 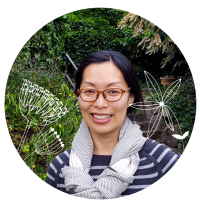 Before we dive in to today’s nature drawing tutorial, let me take a moment to introduce myself! 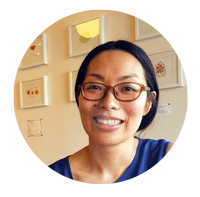 My name is Yuko Miki, and I’m an illustrator, print-maker, and a blogger in Seattle, Washington. 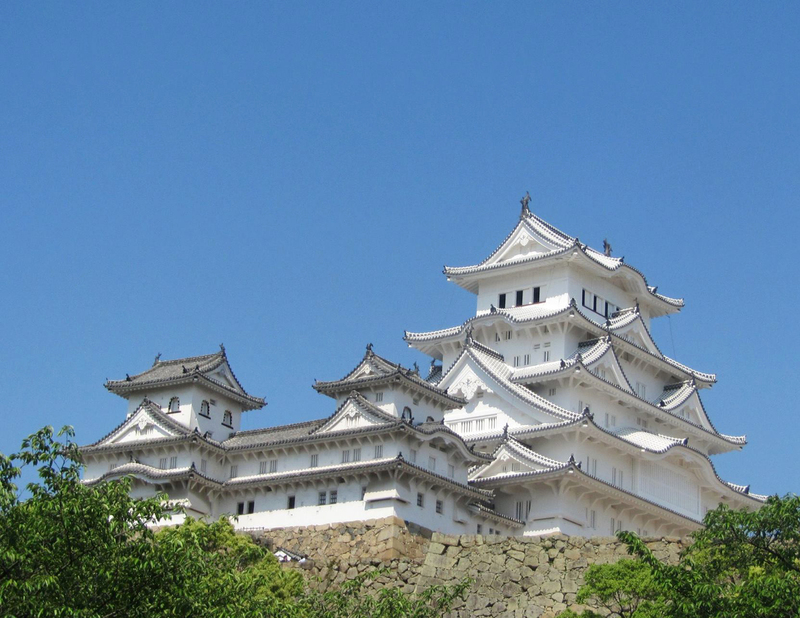 I was born and raised in Himeji, Japan. 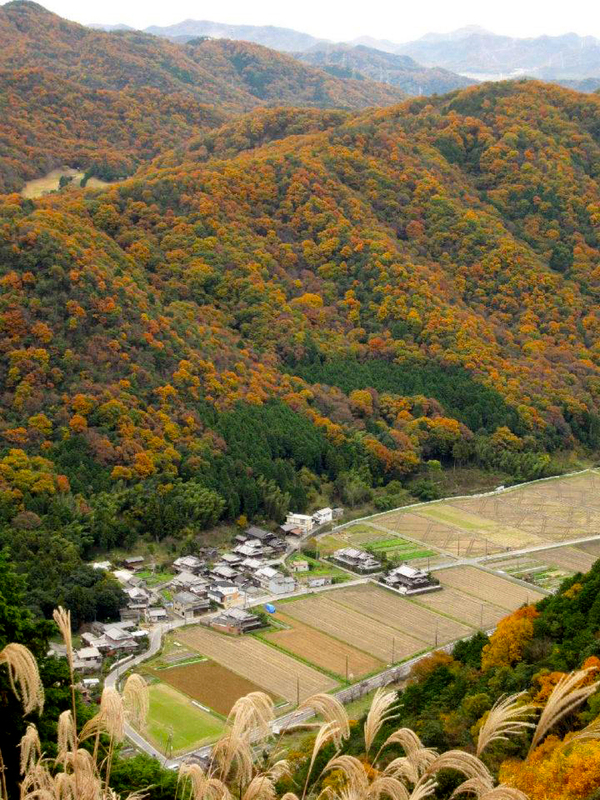 Himeji is a pretty big city, but I grew up in a rural part of the city surrounded by rice patches and mountains. My grandparents grew rice and many of the vegetables we ate. I used to take it for granted and didn’t really think it was anything special. I even thought farming and growing up in a rural area were kind of uncool! 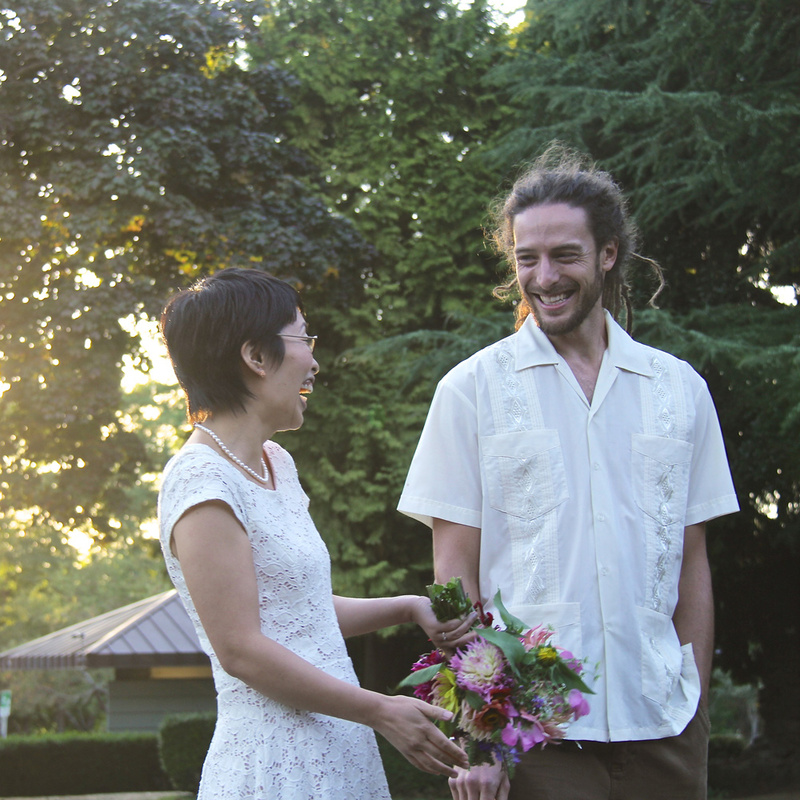 We got married a little over 2 years ago. Boy time flies! My journey as an artist has taken kind of an unconventional route, too. As a child, I enjoyed drawing but moved on to other interests in my pre-teens and didn’t engage in any visual art for a long time. About 5 years ago, at my day job I was doodling some cartoon during a meeting, and my co-worker really liked it and wanted me to draw more. I started drawing here and there for fun and for friends, and I loved being appreciated for what I can create on paper. 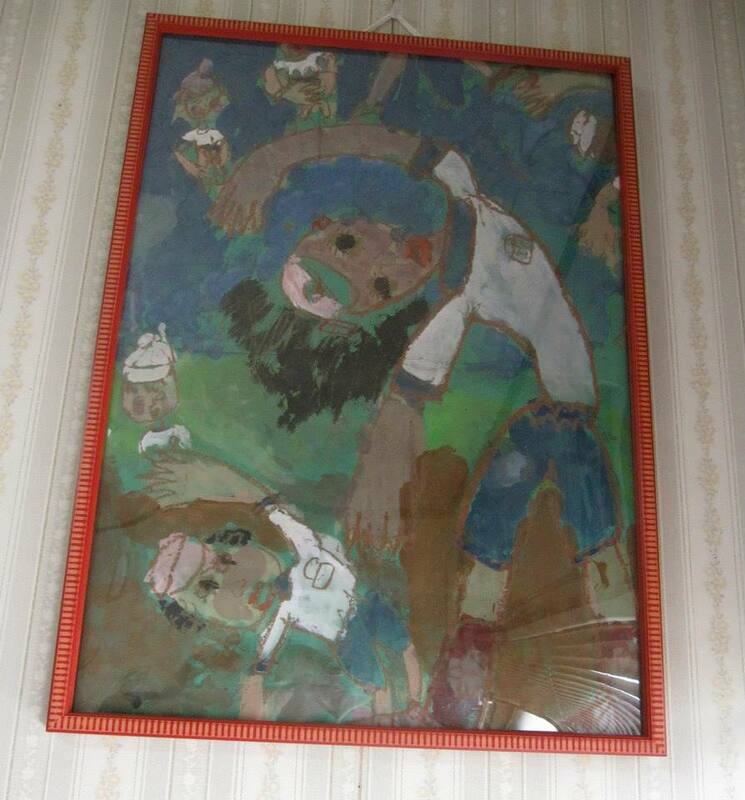 A drawing from when I was little. Not sure how old I was. I love how dynamic kids’ drawings are! I grew to like drawing more and more, but I never thought I could make it as a professional artist. I never went to an art school, and my drawings are pretty wonky. So I enrolled myself in a Graphic Design program at a local college in hopes to become more creatively employable and finished a certificate in 2014. But in my last portfolio review class, I started freaking out a little bit. My work didn’t really look like other designers’. My design was pretty wonky and focused a lot on my illustrations. Oh no, I thought, I’m a bad designer!! I nervously finished my final presentation to the class. Then our instructor, Susan, said to me, “You know, you’re not a bad designer. But you obviously are more passionate about illustration. 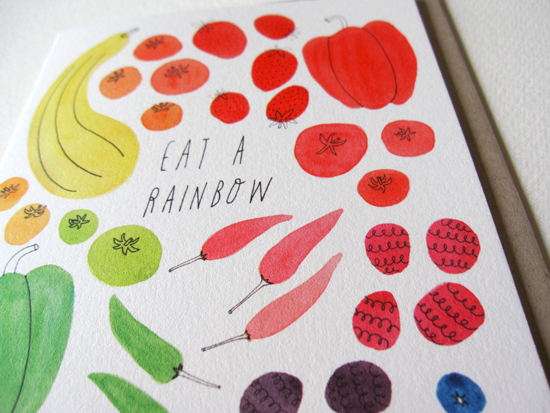 Why don’t you just pursue illustration?” And I knew then and there that’s what I needed to do. I’d been so concerned about how unpractical my dream was and didn’t have a lot of confidence in my work even though people around me saw my potential. It’s so funny how you sometimes feel like you need a permission to follow your dream! 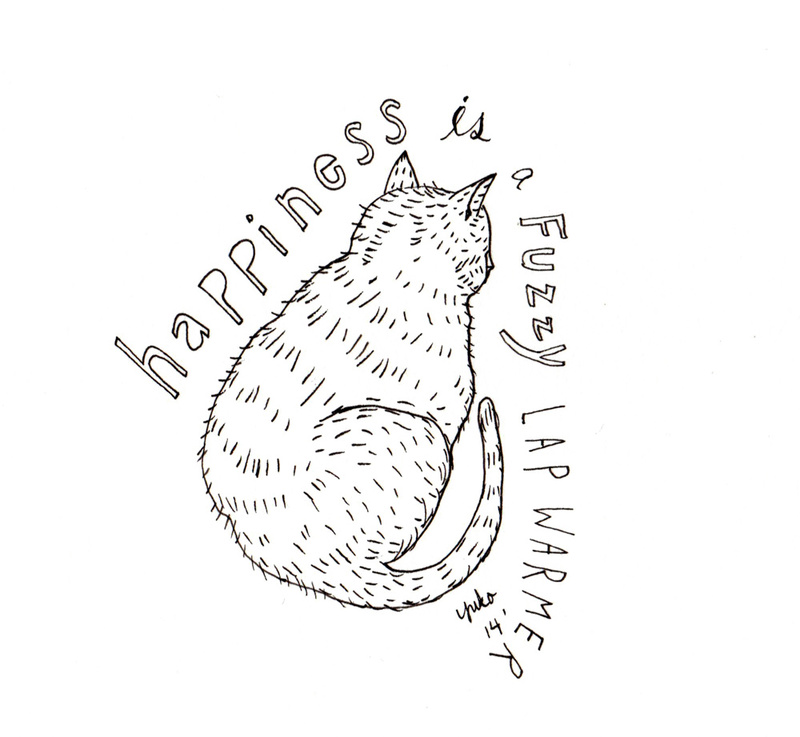 Anyway, then I started a daily drawing project back in April of 2014 where I made a drawing about happiness and shared it on the internet every day for 365 days. It helped me gain some traction, and I developed a daily creative practice helped me grow as an artist. 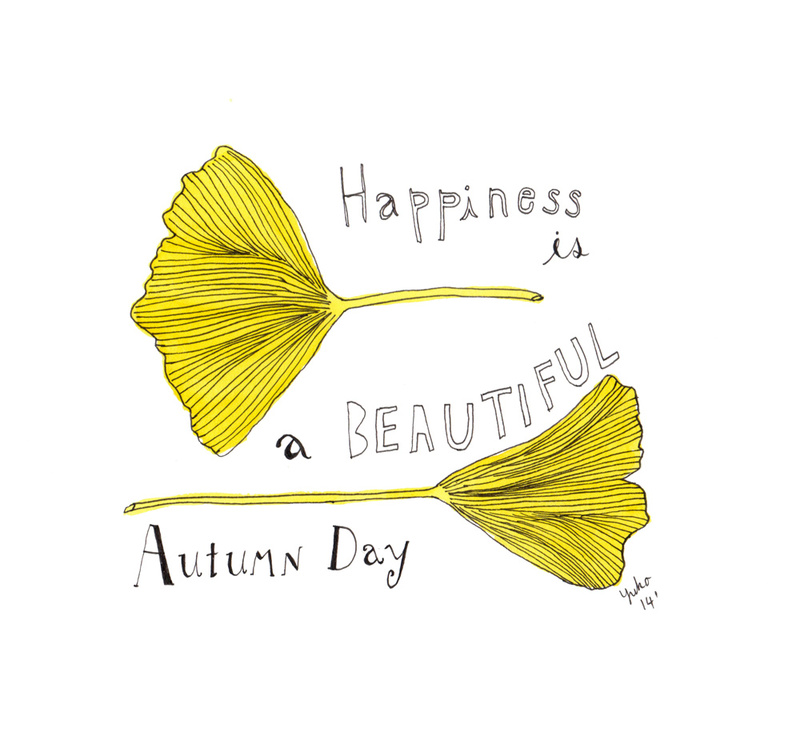 A lot of my daily happiness drawings were inspired by nature. And somehow the universe aligned, and I was able to quit my day job at the end of July 2015! 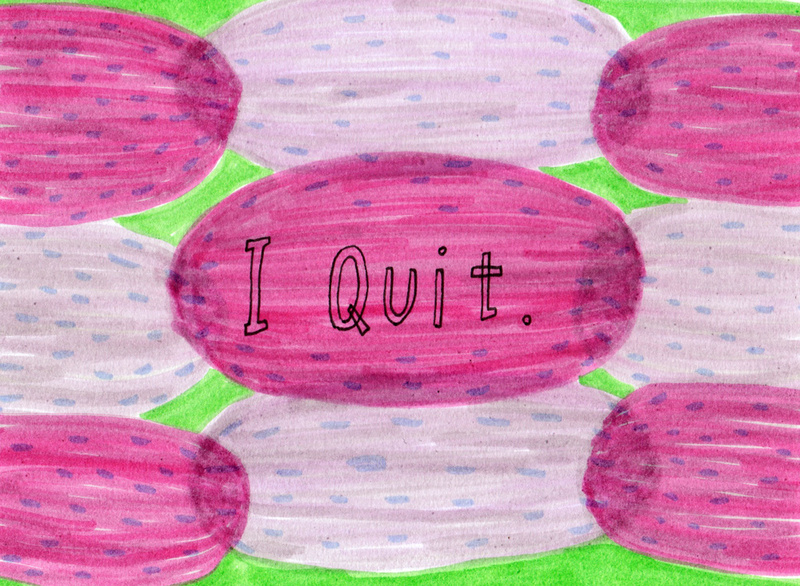 If you’re interested in learning more about how and why I quit my day job, you can read it here! OK I think you got a good sense of who I am and what I’m about… Now, back to our topic for today! 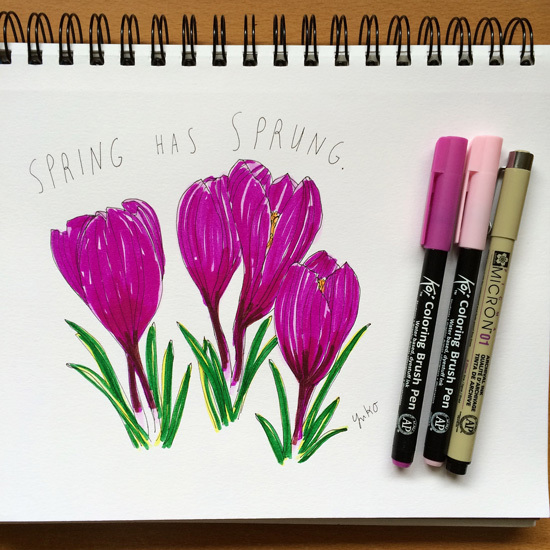 I was stoked when Kelly Johnson from the Wings, Worms, and Wonder approached me to join her Draw Yourself Back to Nature Blog Hop! She’s asked the participating artists to provide a nature drawing tutorial, and I was so excited to join because I’ve been wanting to create tutorials for a while and hadn’t done one yet. My tutorial is loosely related to Kelly’s nature journaling tutorial prompt No. 1 from her ECourse (which by the way is packed full of awesome resources and tutorials, easily worth more than what you pay!) 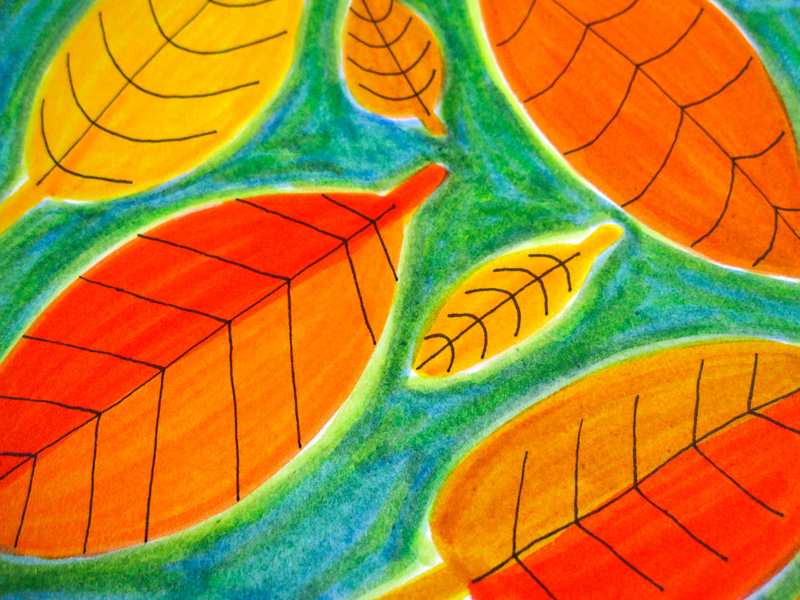 where she teaches you how to draw nature by breaking them down to simple shapes. I like using simple shapes and lines, and most of my work is pretty flat as opposed to photorealistic. 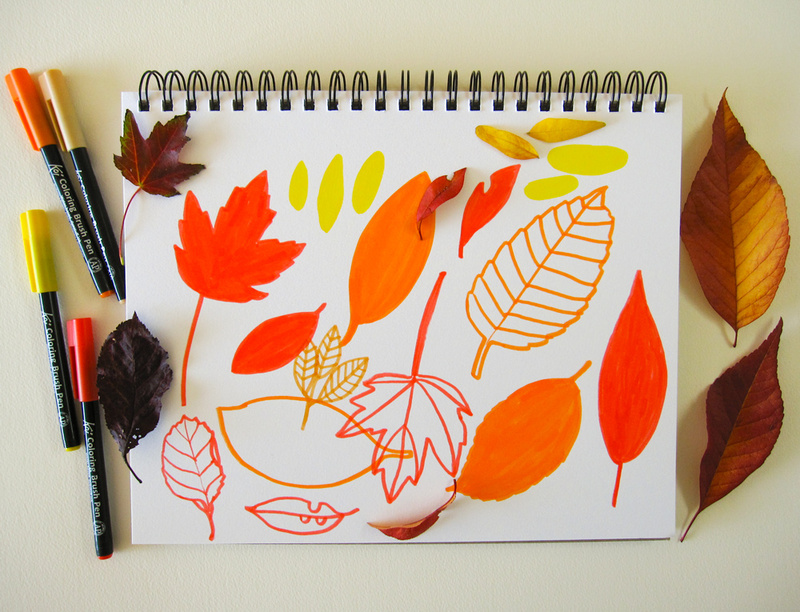 So here is my brand new Fall Leaf Doodle Tutorial I created for you! 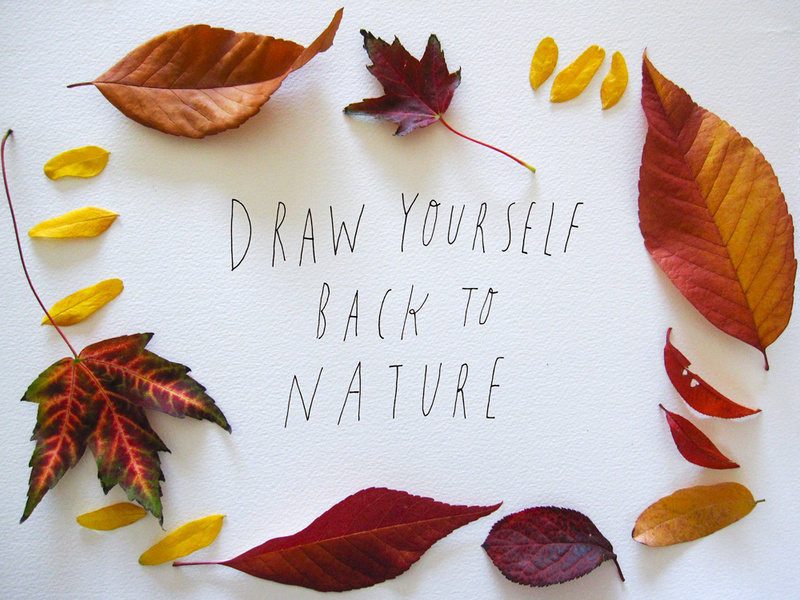 Follow along the steps and create your own nature-themed doodles. Have fun! 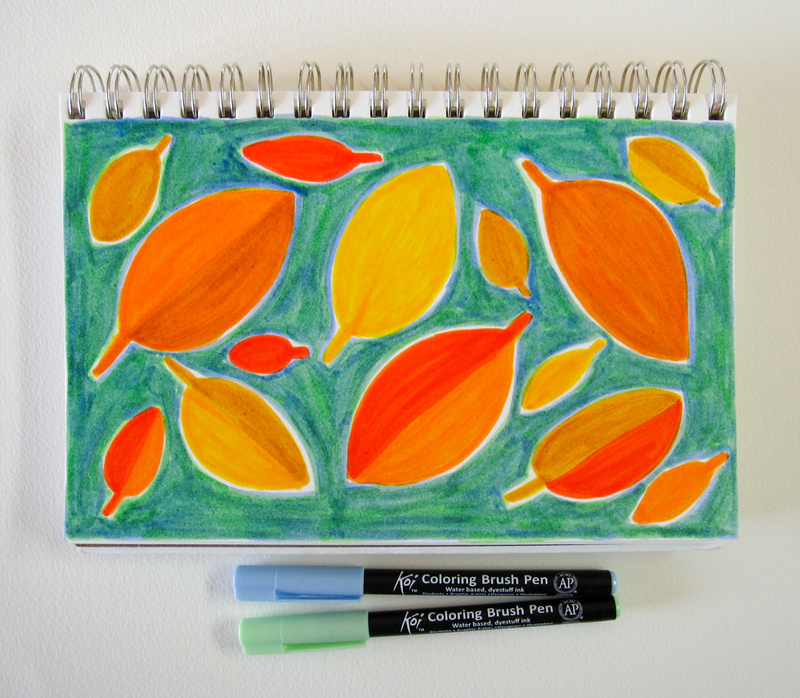 1) Materials you need for this tutorial: sketchbook, coloring markers & drawing pens. I used Bee Paper Super Deluxe sketchbook, Sakura Koi Coloring Brush Pens, and Pigma Micron Pens (size 01 and 08 in black are my favorite!) in this tutorial. Of course this is not a requirement to use these specific brands/products, and you can use what you already have and are comfortable with. I enjoy drawing with different mediums (watercolor, gouache, colored pencils, etc), and I like the portability of the markers when you’re on the go. Since you can layer and draw without worrying about the colors bleeding into each other, you have more control over the piece as well. 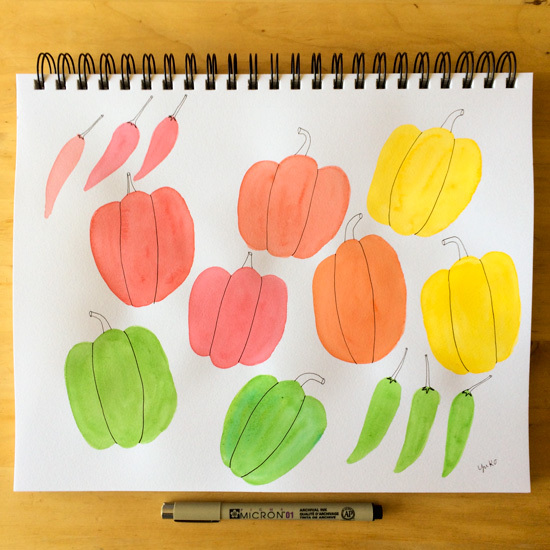 For this tutorial, I used Pale Orange, Yellow, Vermilion, Coral Red, Woody Brown, Orange, Fresh Green, Light Sky Blue, Light Warm Gray, and Ice Green Koi Coloring Brush Pens. 2) Gather your inspiration and references! 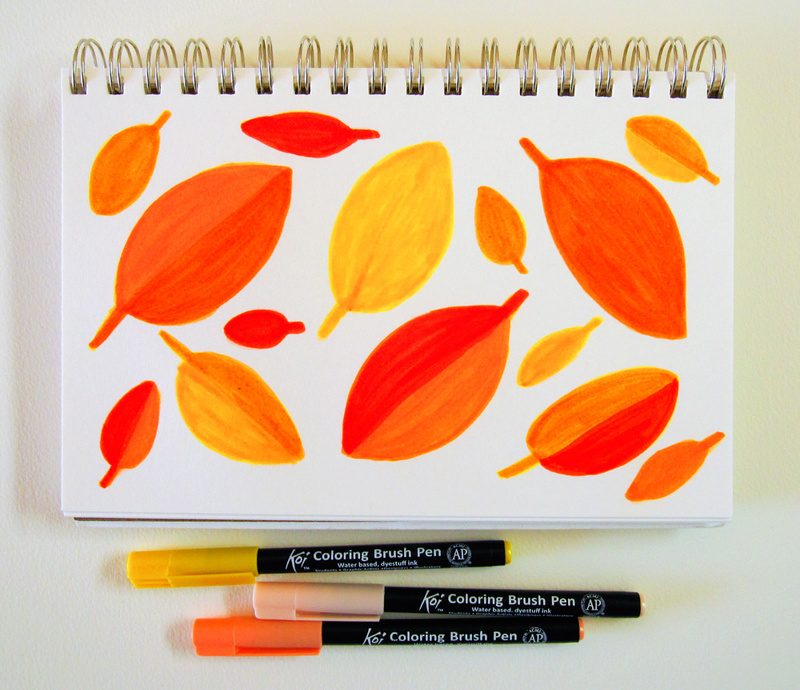 For this tutorial, I’m drawing fall leaves that spread and fill one page of your sketchbook. Since I typically draw things in simple and stylized manner, I like to look at several different images to get the feel for what I’m going to draw. 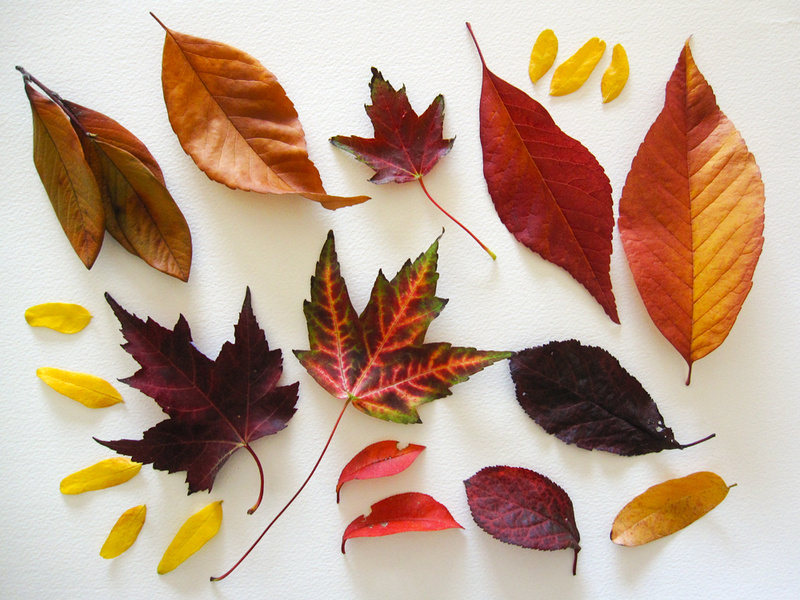 Like Kelly mentions in her tutorials, you can do a goodle image search and/or go out and pick up leaves from outside! 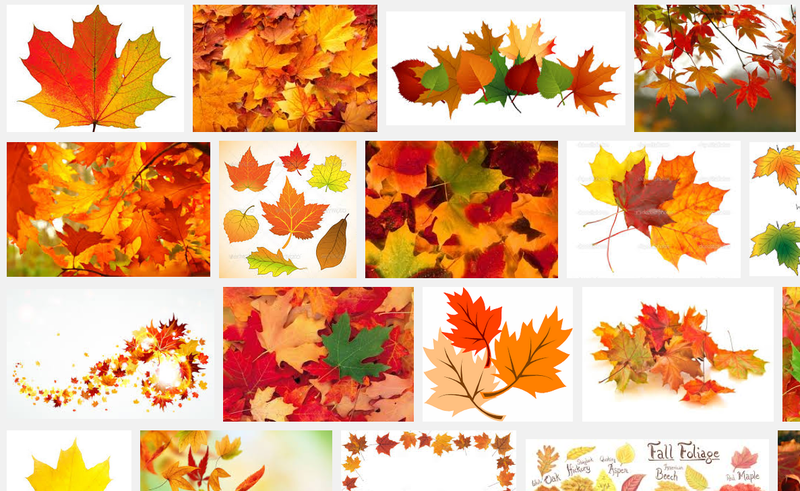 A quick google images search for “fall leaves” returns lots and lots of pretty images. And I found these pretties on a quick walk around my neighborhood. 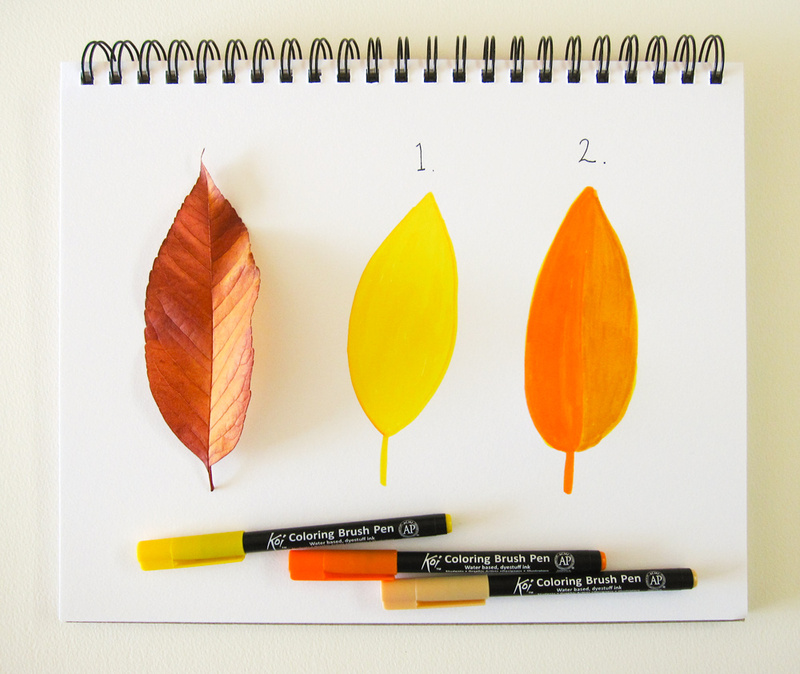 3) Pick a couple of leaves from your references and practice drawing them with a marker. Like Kelly mentions, we’re not trying to be scientific botanical illustrators here. As a commercial illustrator, it’s more important to me that my drawings have my voice (a.k.a. my style) than how accurate or real they look. My style is simple and whimsical, and it makes my art fairly accessible to people. You might be wondering, “I don’t know what my style is. How do I find it? ?” Well, unfortunately, there is no shortcut for finding your style. But you can find it by 1) paying attention to what you’re attracted to aesthetically, and 2) practicing a lot. Whether you’re attracted to more realistic art or stylized illustrations, only way to get better and deepen your style is to practice. 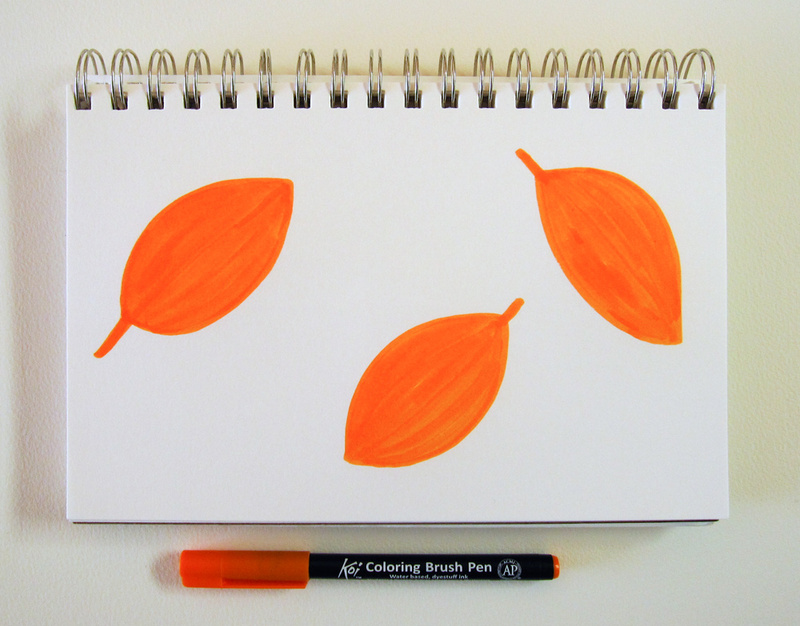 So turn to your sketchbook or any scratch paper, and start making simple drawings of the leaves you chose with special focus on their shapes. Don’t worry about any mistakes or details. Draw it big. Draw it small. Maybe exaggerate certain aspects and see what you think. If it’s wonky, that’s OK. Nobody is going to see this, so just relax and have fun 🙂 Think of it as your visual brainstorming session! There is no need for judgement or order. Don’t be precious with this. Just go for it. If you’re intimidated by more complex shapes (like the maple leaf), start with the basic oval-almond shaped ones! Some examples of how your marker sketches can look like. Very simple. 4) Experiment with layering different colors. 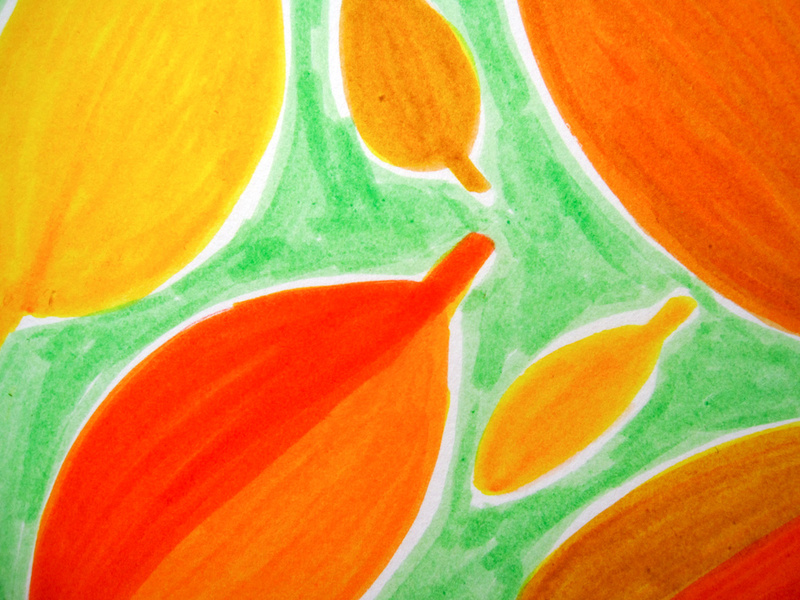 One of the things I like about drawing with markers is that I can layer the colors in a very controlled way. Sometimes you have a good idea of what it looks like with multiple colors layered, but other times it can be a total surprise. Occasionally, you mix two colors (e.g. any complement color combo) that you thought were interesting and get a muddy mess. 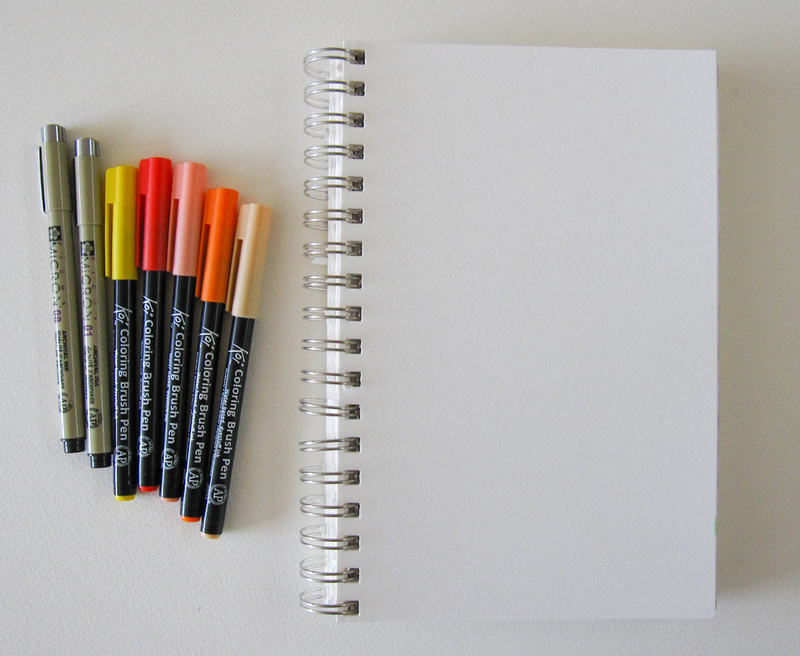 So just test them out on your sketchbook or a scratch paper. 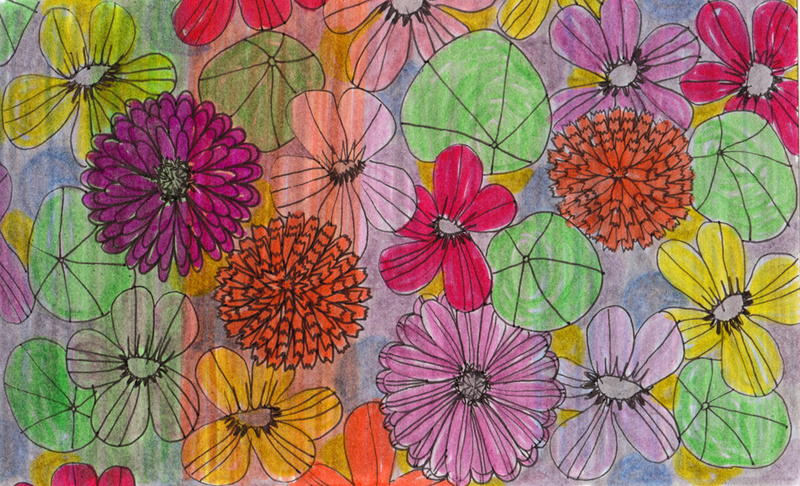 Example of layering colors. 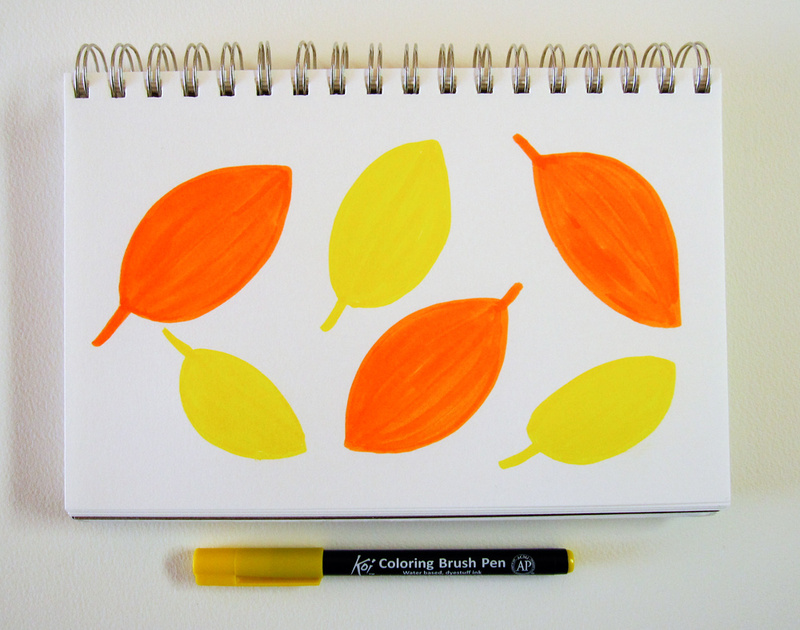 I used 1) Yellow to draw the first leaf and 2) layered Orange on the left half and Woody Brown on the right half. You can achieve more subtle hues by layering colors. Similarly, in this example I show the 1) outline 2) filled with Vermilion as a base color and 3) layered with half Light Warm Gray (L) and half Burgundy (R). Layering with gray is a great way to tone down a bright color. 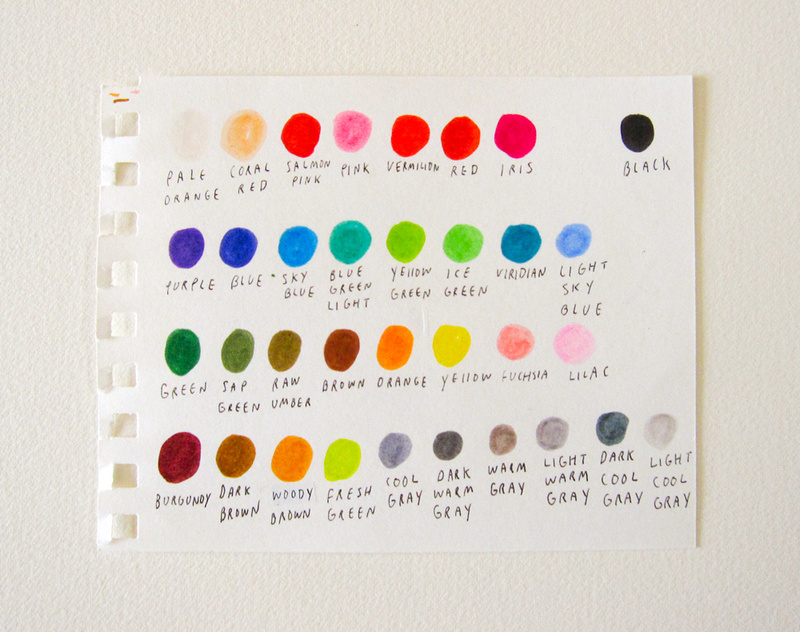 On a side note, I like having a color chart of the makers I have so I don’t have to test it every time. 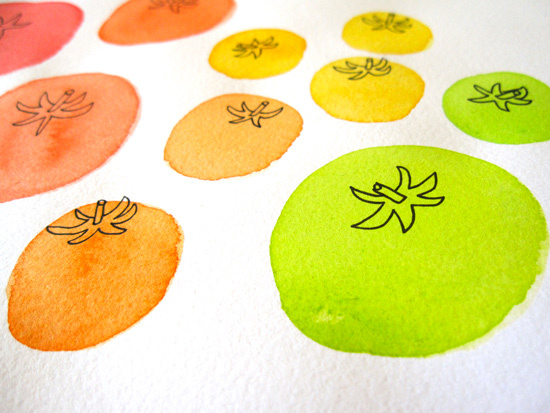 You can simply draw small shapes with each color, put their name below the swatch and keep it somewhere handy! 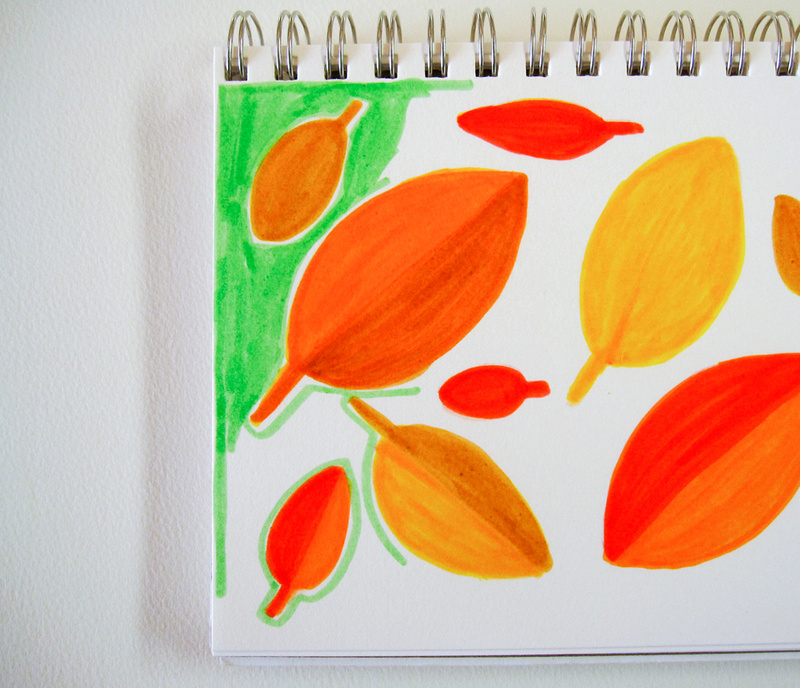 5) Once you practiced drawing some shapes and layering colors, let’s fill your sketchbook page with them, shall we? STEP 1: Chose one base color. 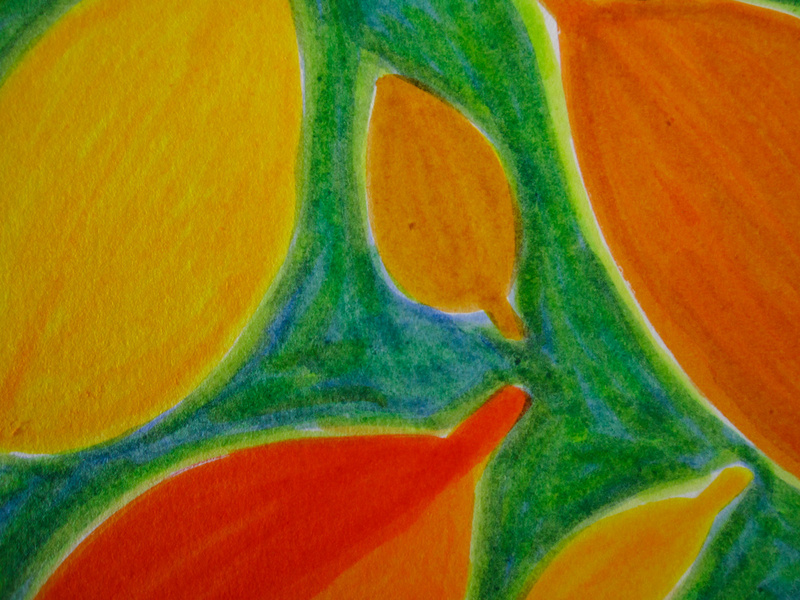 I prefer to start with a lighter color to make it easier to layer on later (I’m using Orange marker here). 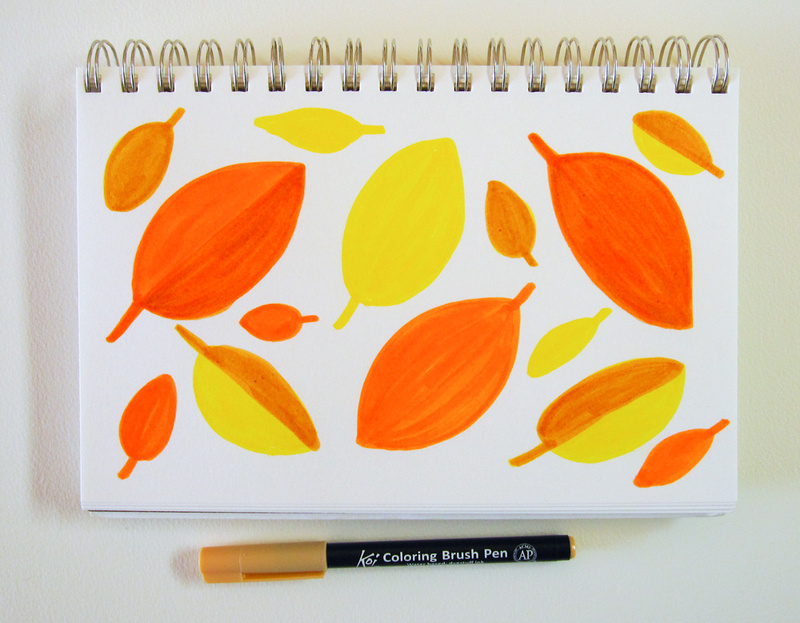 To make this tutorial simple, I’m going to use one basic leaf shape for this piece. 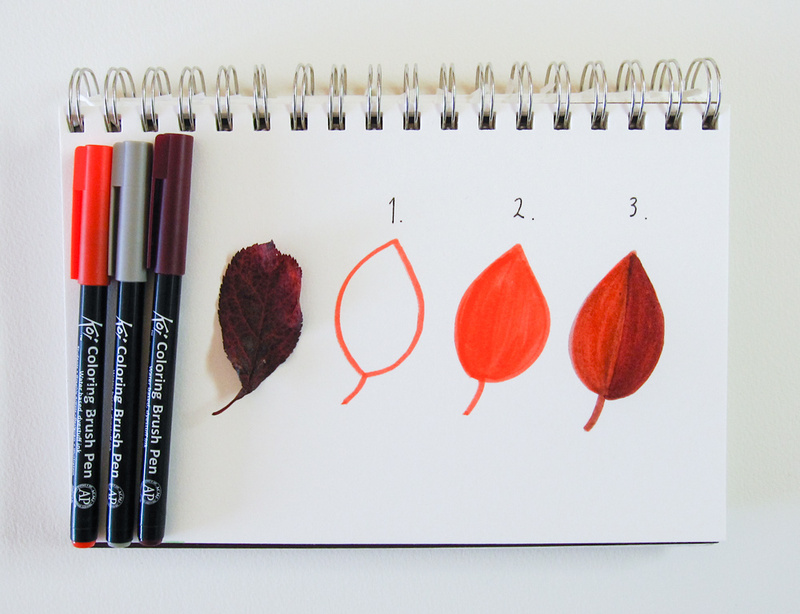 Draw a few larger leaves with your base color. Don’t place them so tightly together as you’ll be filling the white space in the following steps. I like to just go for it without drawing with pencils first, but if you’re nervous or have a specific pattern in mind, feel free to draw the shapes with the pencil first and fill it in with the marker. 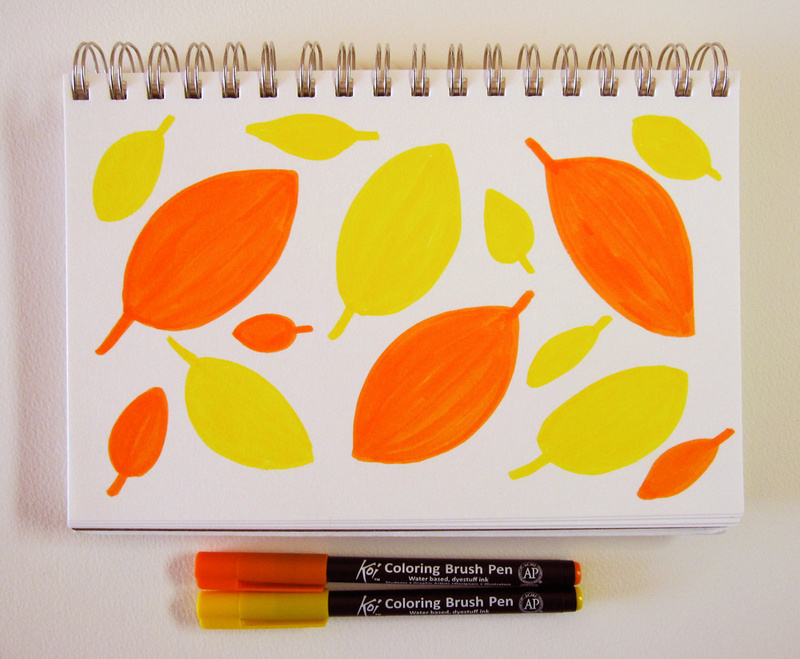 STEP 2: Chose another base color (in this case, Yellow) and draw a few more leaves in the white space. Again, leave some space in between. 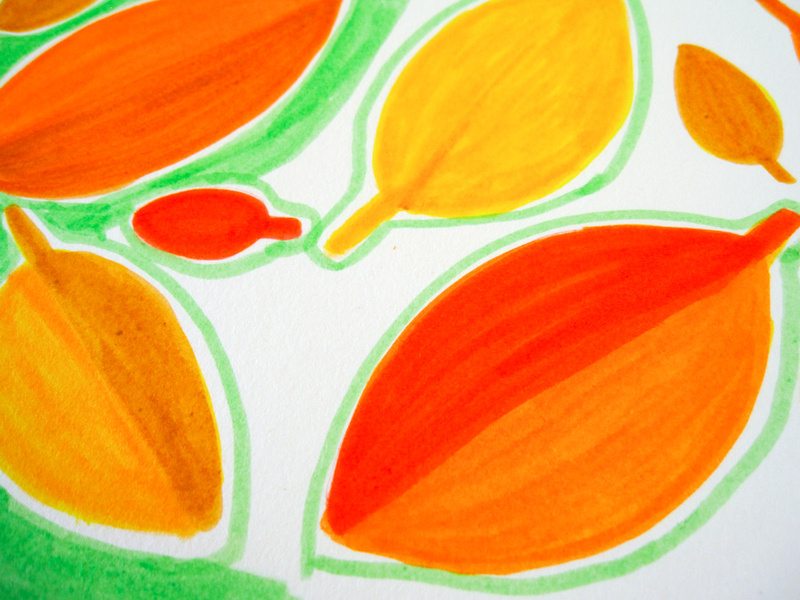 STEP 3: Using the same base colors, add in smaller leaves in the white space. Vary the directions, sizes, and shapes slightly to fit in the space. Leave some white space between the leaves. STEP 4: OK, now it’s time to layer some colors on top of the base colors! 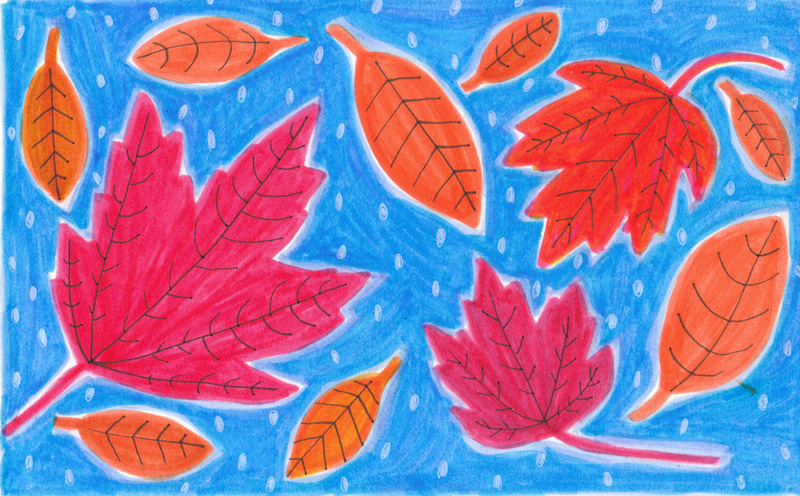 I added Woody Brown color to some leaves. It’s a nice subtle fall color. Koi Brush Pens work sort of like watercolor so the base color still comes through the layers. 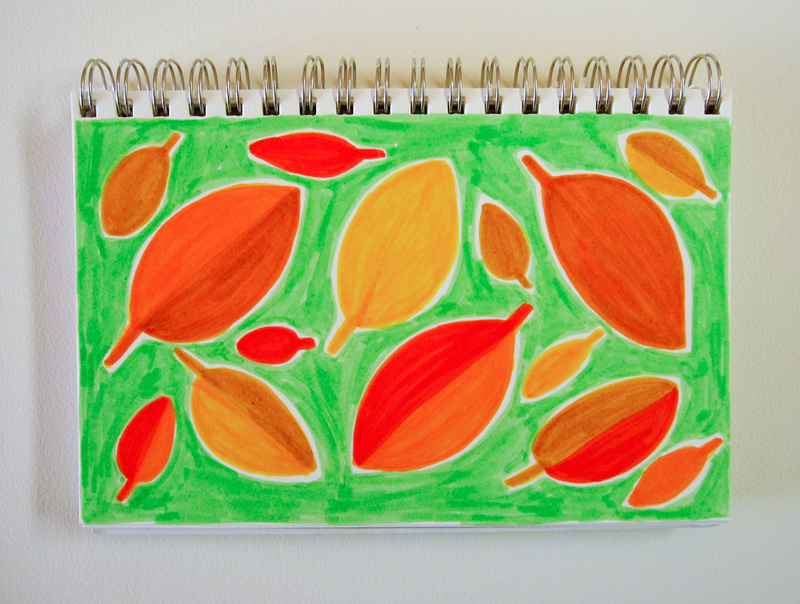 For some leaves, I covered the entire shape, and for others I just layered on half of the leaf. STEP 5: Then I added Vermilion on top of some of the leaves. This color really pops! 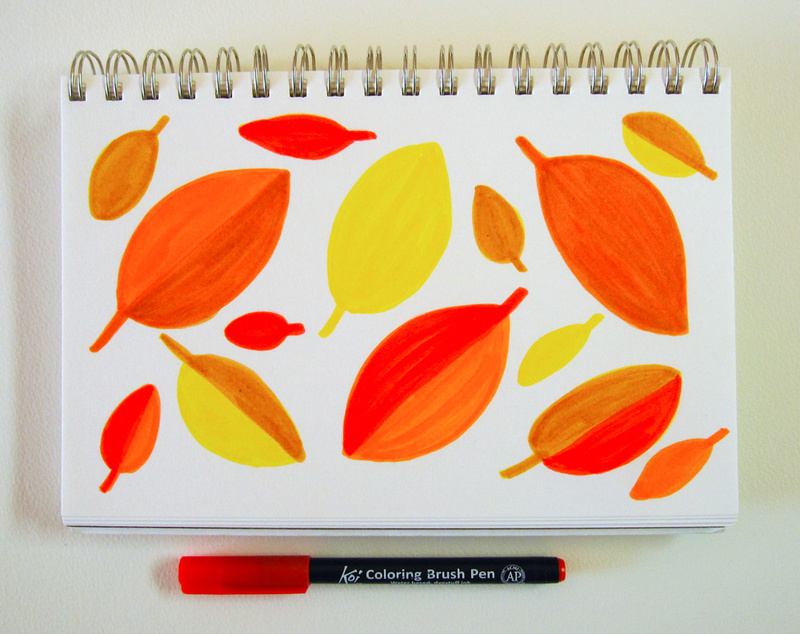 STEP 6: Then I went over the leaves with either Yellow, Pale Orange, or Coral Red. I typically layer 3 times (base + two layers) either with 3 different colors or same color multiple times to get the hue and depth I want. 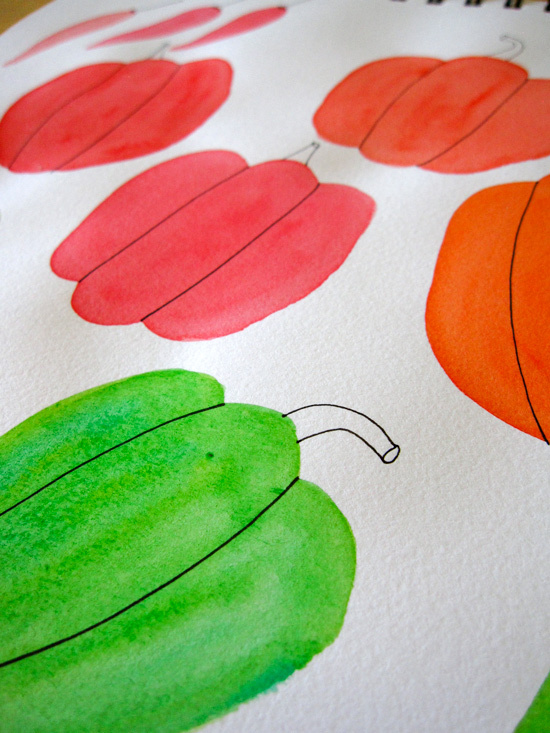 STEP 7: Once you’re happy with the leaves, let’s decide on the background color! 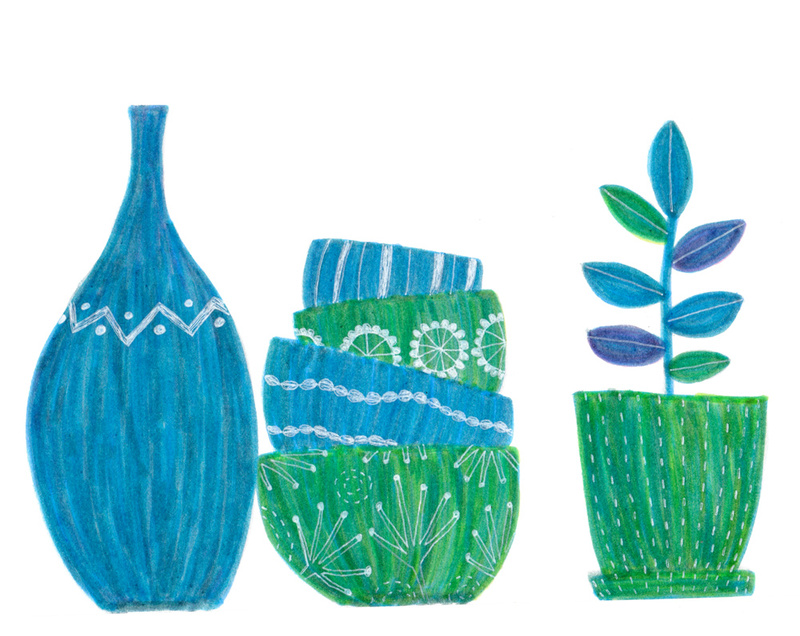 I wanted the warm fall colors to pop, so I decided to go with the blue-green hues (their complementary color scheme.) 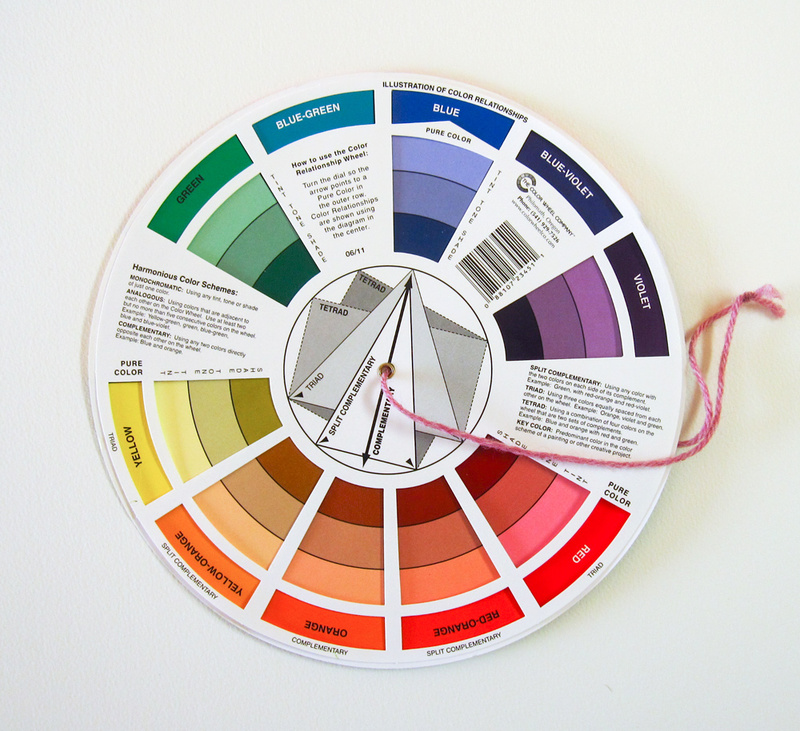 You can learn more about color theory here. 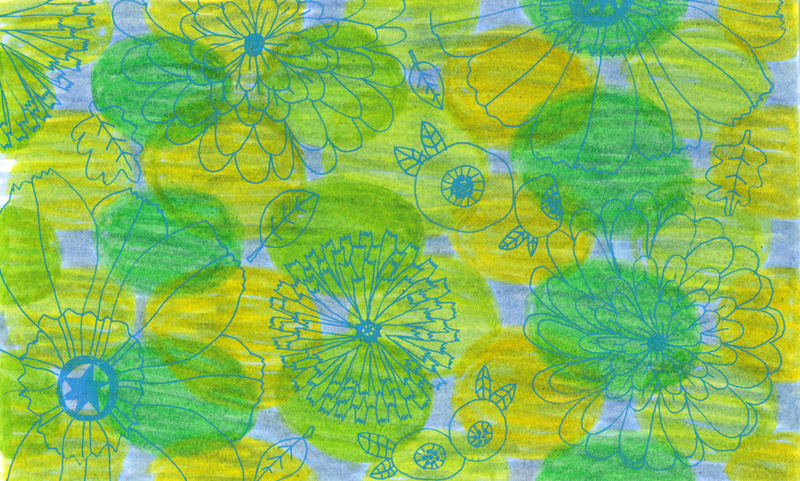 I picked Fresh Green, Ice Green, and Light Sky Blue for my background. STEP 8: Fill in the background! 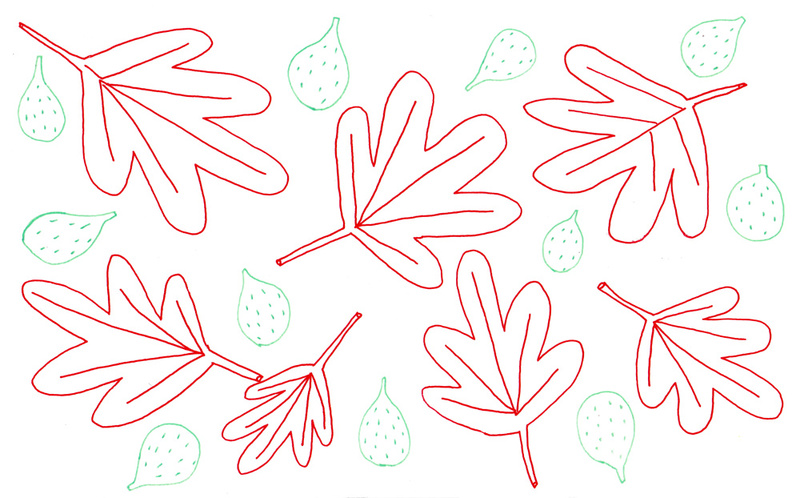 I like to draw lines around the leaf shapes as I go so I don’t accidentally draw over the leaves. 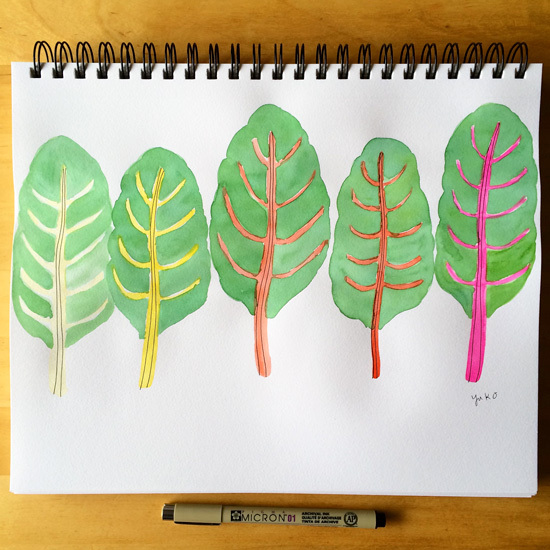 When I’m filling the larger space I can go faster in bigger strokes, and the lines around the leaves signal me to slow down. I like to leave a small white space between the leaves and the first background layer. I’ll tell you why in a minute. First background layer is done! You can see the strokes pretty well. I like the look but if you prefer not to have stroke lines be so visible, you would need to pay more attention to the directions and length of your strokes. STEP 9: Let’s add another layer to the background! I’m using Light Sky Blue here. So this is why I like to leave a small gap between the leaves and the background. 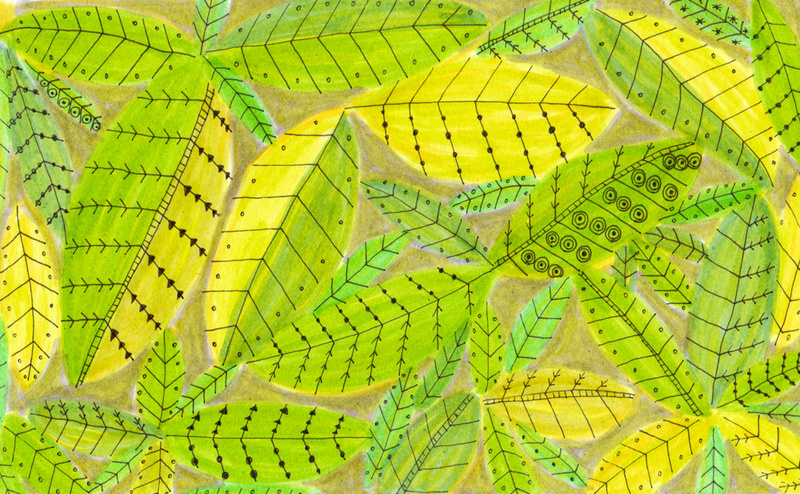 As you add second and third background layers, you can come in a bit closer to the leaves than the first layer did to create a boarder with only two or one color layered. This creates lighter colored boarder around the leaves, which helps the leaf shapes pop. You don’t need to be precise about this process. Play around with it to find what you like. STEP 10: Add the final layer. I used Fresh Green marker here. You can probably see that I layered it on pretty loosely. Again, if you prefer a more uniform or flat look, you just need to be more mindful of your strokes. Close-up. 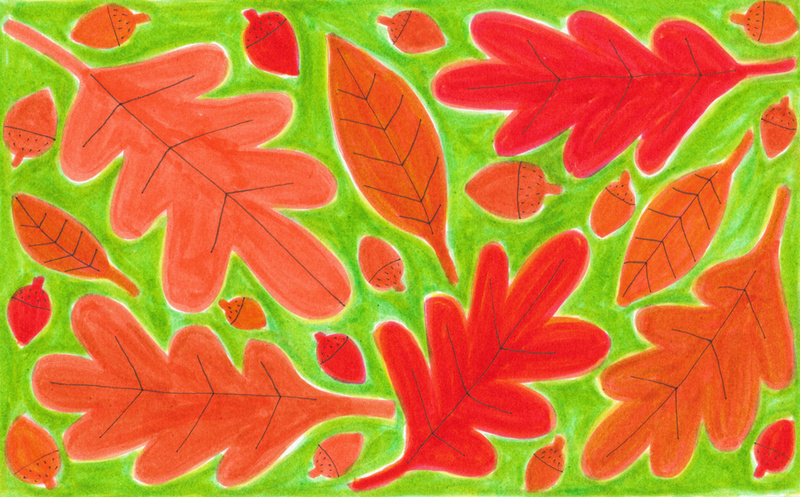 At this stage, the background colors go up to the edge of the leaves to fill the white boarder around them. I still leave some white spot peeking through. STEP 11: This is the final step! Add the veins with your drawing pen! I used the Micron size 01 in black. You could try a few different styles of veins, like straight lines going all the way to the edge of the leaf, shorter ones, curved veins, tightly spaced vs. widely spaced etc. I like to add the pen lines at the end because it sometimes runs if you go over it with the markers. And the black lines are sharper/crisper when you add them at the end. I love this method of doodling because it’s really accessible and fun. 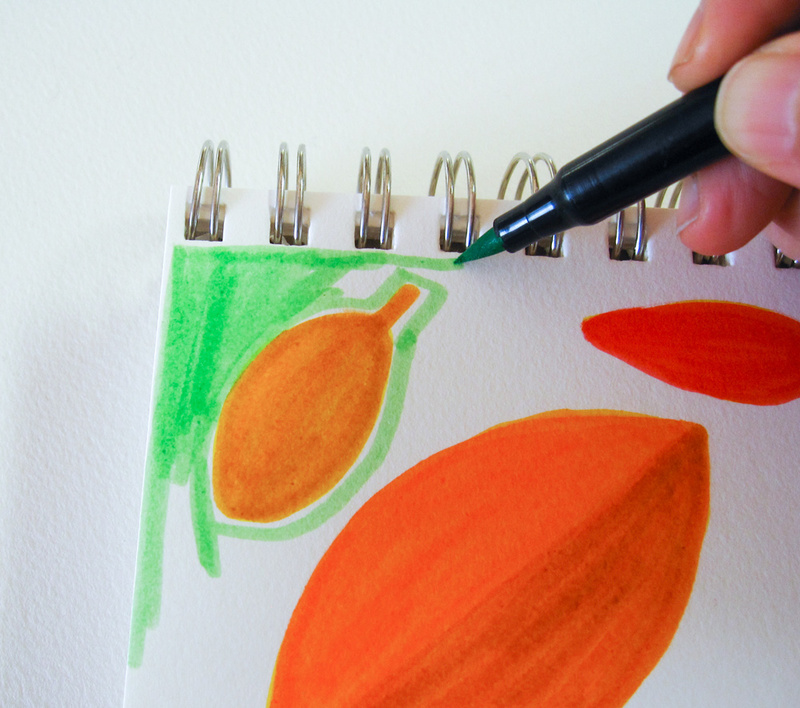 My favorite time to doodle with markers is after dinner when my husband and I sit down to watch our favorite Netflix shows 🙂 Because I’m drawing simple shapes and not worrying about details so much, it’s a perfect activity to relax and unwind with. I hope you enjoyed my tutorial! This was my first time putting together a tutorial, and I had a lot of fun and learned from it too. 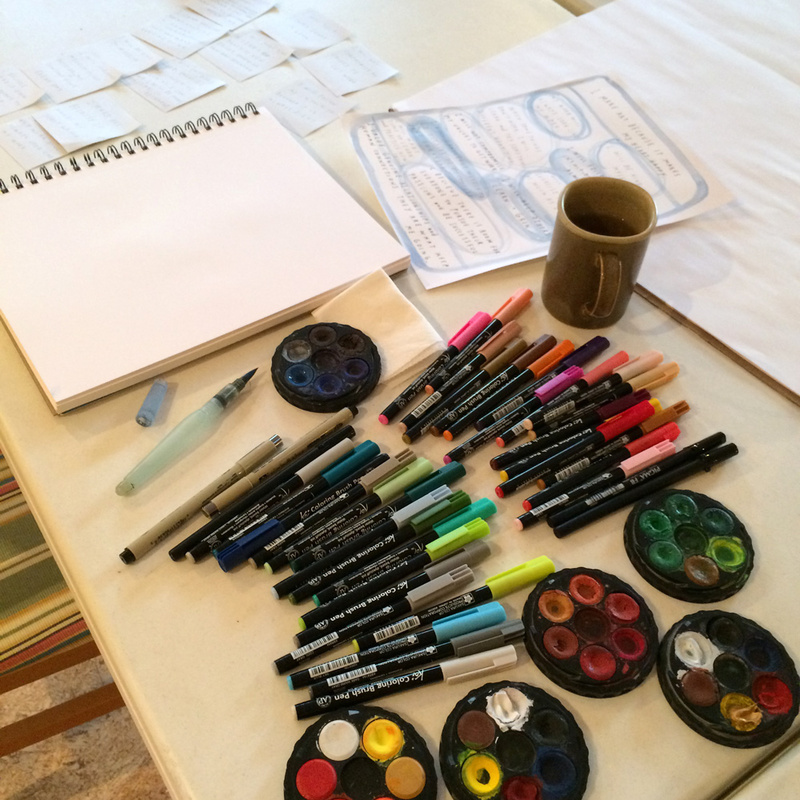 OK, before you go off to create your own doodle masterpiece, I have a few quick announcements! 1) Tomorrow’s blog hopper is Carolyn Lucento of Magical Movement Company! Be sure to check out her blog here for another tutorial and a sweet giveaway! 2) Kelly Johnson’s hosting a live hour where she’s doing a simple journal making tutorial and having a Q&A on Friday the 9th at 1 pm EST. More info here. 3) And last but not least, I’m giving away the original drawing I made for this tutorial to one lucky winner!! To enter, simply comment on this blog post before the end of this Sunday 10/11 at midnight EST. I’ll pick one winner, and the winner will be announced on Tuesday 10/13 on Wings, Worms, and Wonder’s blog! 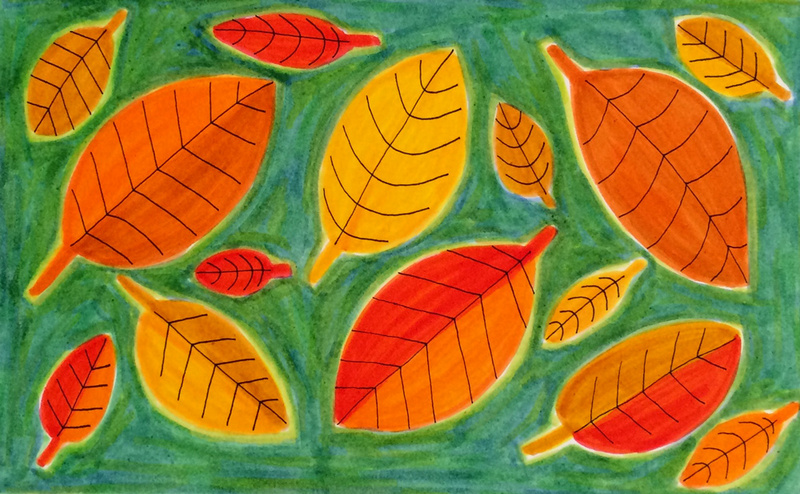 Fall Leaves, 5.5″ x 9″, markers, pen & ink on archival paper. Thank you again for hanging out with me!! If you’re new to my work, let’s connect on Facebook, Instagram, or Twitter, and be sure to sign up for my monthly newsletter. Have a wonderful week connecting with nature and creativity 🙂 Talk to you soon! It’s October! WOW! I feel like I’m saying this every month…but where has the time gone?? At the time I’m writing this post, it’s still September. September turned out to be a really busy month. I’m grateful for all the opportunities I’ve gotten, and I definitely over-committed. Plus we had a loss in our family and had to take off several days to attend an out-of-state funeral on top of it. So I’ve been working a lot to stay on schedule with my commitments and due dates and not doing a very good job of taking a break. I don’t like it, but I signed up for this. Sigh. 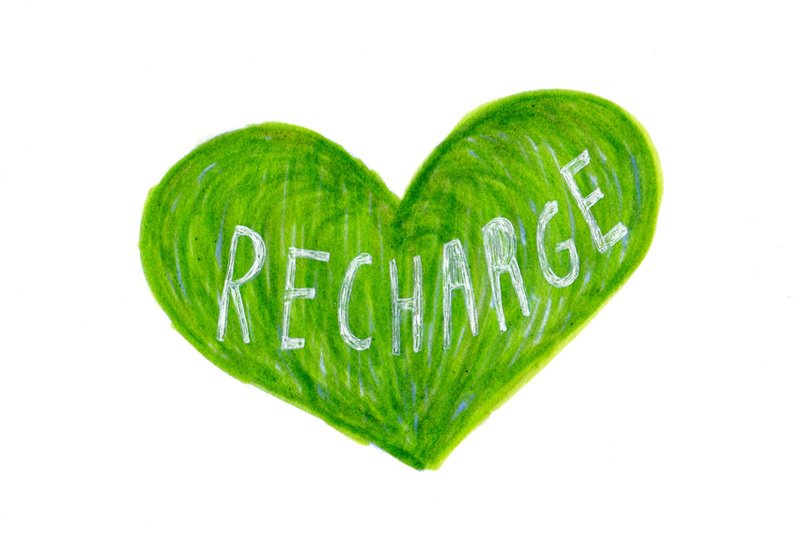 I’m still planning on taking a week off to step back from my day-to-day and recharge (a.k.a. small scale sabbatical) starting Monday, October 5th!! I’ve been talking a lot about why you want to work hard every day to achieve your goal. Today I want to share how “play time” is also very important for artists. 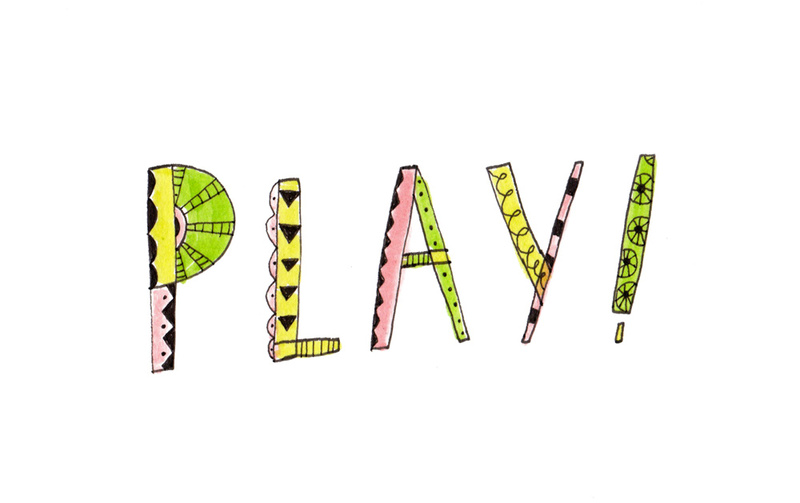 When I say play, I’m not talking about go-carting or laying on a beach in Hawaii. Yes, those things are important, too, but I’m specifically talking about creative play time. 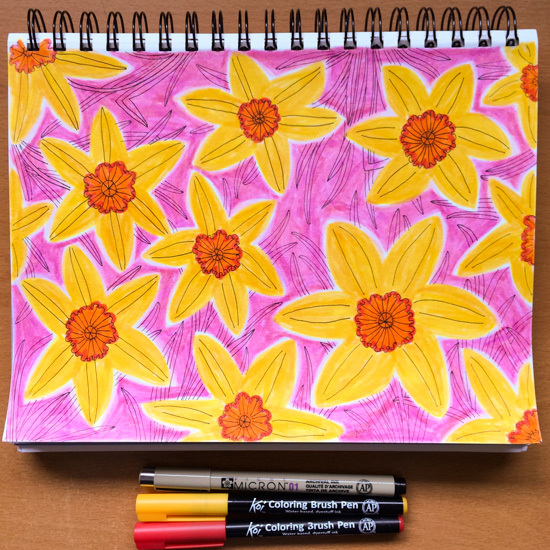 It can be doodling or any self-directed creative projects. I’m gonna talk about doodling here because most of my self-directed projects start with doodling. Doodling is great. It’s free-flowing. It’s loose. You can experiment all you want, and nothing is a mistake. Nobody is telling you how to draw or what it should look like. It’s fun and engaging. Because doodles often represent the core of what you like and do well, they are great tools to discover and deepen your voice too. 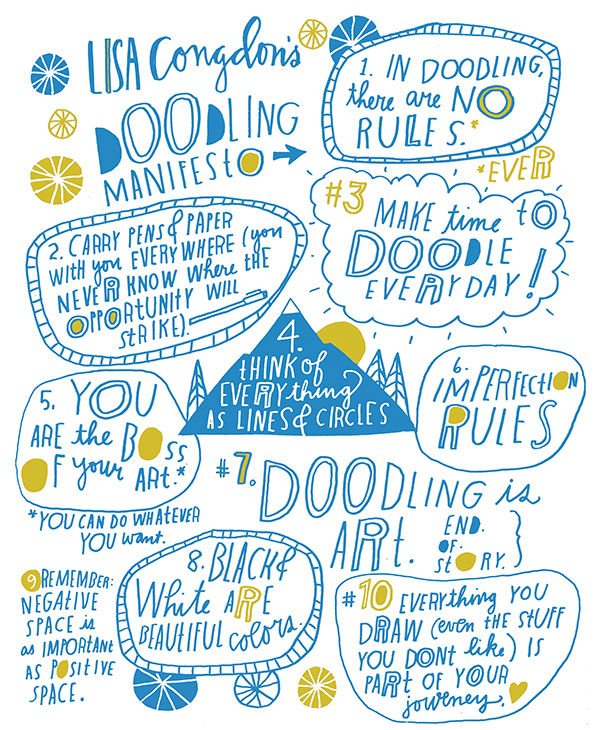 I love Lisa Congdon’s doodling manifesto so much ❤ Doodling rules! 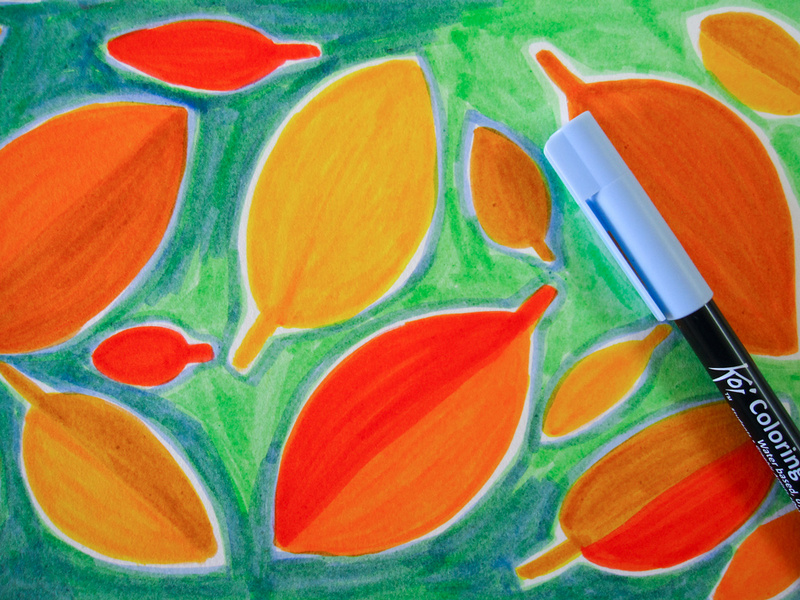 In doodling, you might find a medium you like or discover a composition you haven’t thought about. Because there is no mistake in doodling (YES! ), you can try all sorts of color combinations and styles, too. I sometimes start doodling and don’t like what I draw. But then I look at it later and re-work it and end up liking the results. By doodling every day, you exercise your creative muscles every day. You’re building a creative muscle memory of how to get into your relaxed yet focused mode. And that is the optimal state you want to be in to do your best work. It’s kind of like meditation. The more you practice being present, the easier it gets to access that part of you. Because my doodles often represent what makes my work unique and special, I find inspiration for most of my future work from my doodles. When my husband is not traveling for work, we usually watch a couple of shows on Netflix during and after dinner. 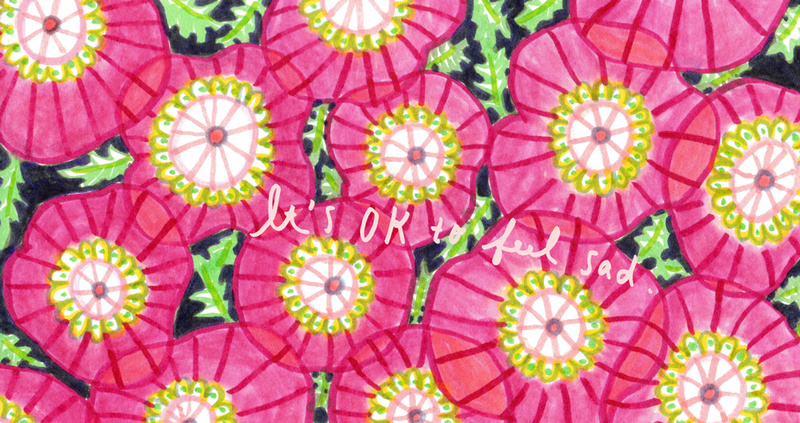 I usually doodle while we’re watching (or listening, more accurately) something in the evening. I like doodling sort of abstract motifs while watching something because it doesn’t require the precision and care that more representational drawings might require. If it’s wonky, it’s OK. 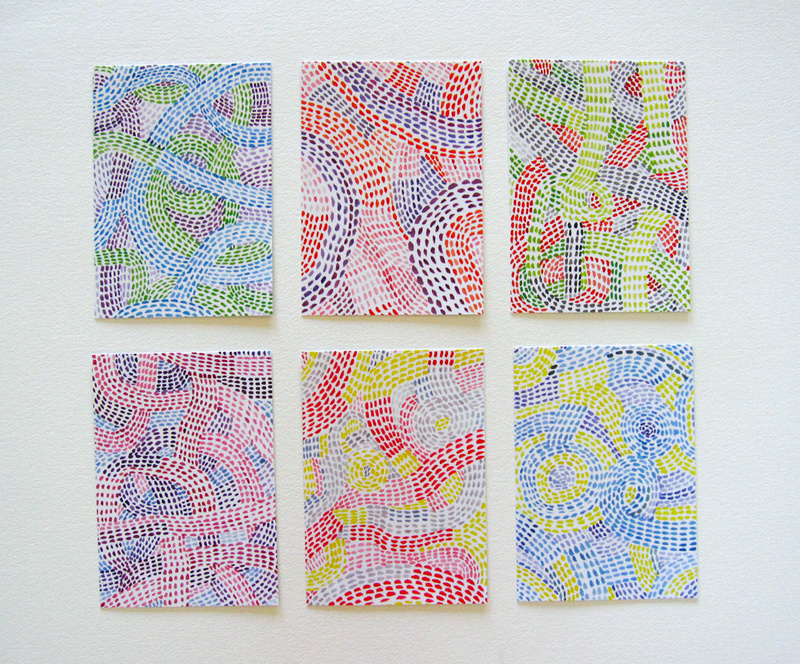 Anyway, I doodled a series of small watercolor abstract paintings over a course of several days. Just loose, fun, and flowy experiments. 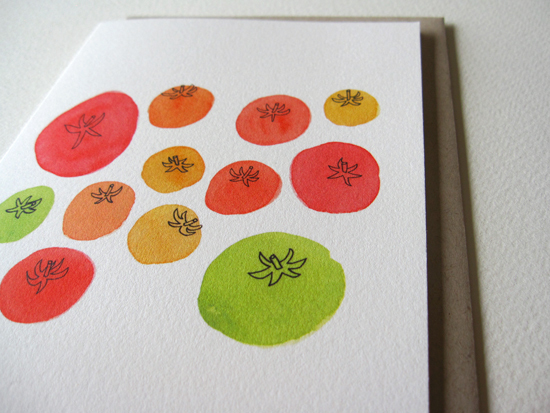 But I really liked how they turned out, so I turned them into postcards! 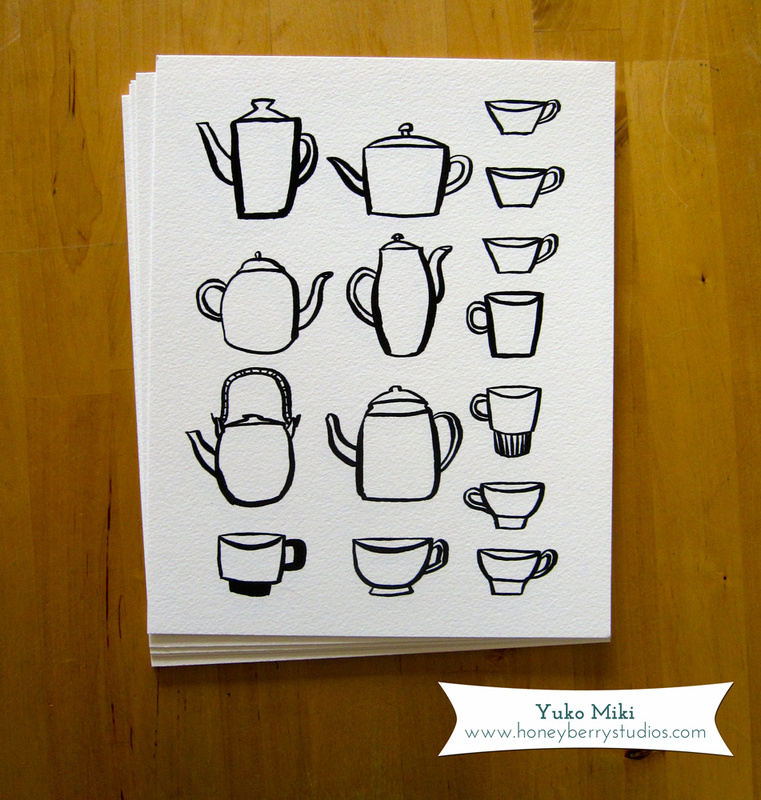 I used Moo Printfinity service so I could print multiple designs without committing to printing a larger number of each. I’m very happy with the quality of their postcards! 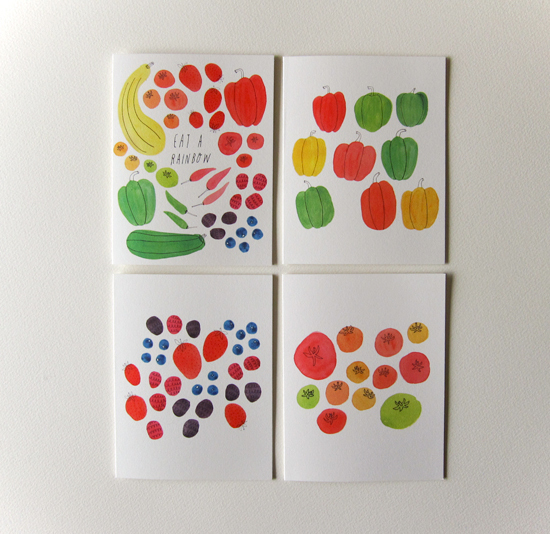 I made the postcards for my monthly art subscription customers for September. And I showed it to the manager of my neighborhood art gallery, and now they carry them in their gift shop among other goodies I made. These are also available for purchase here. 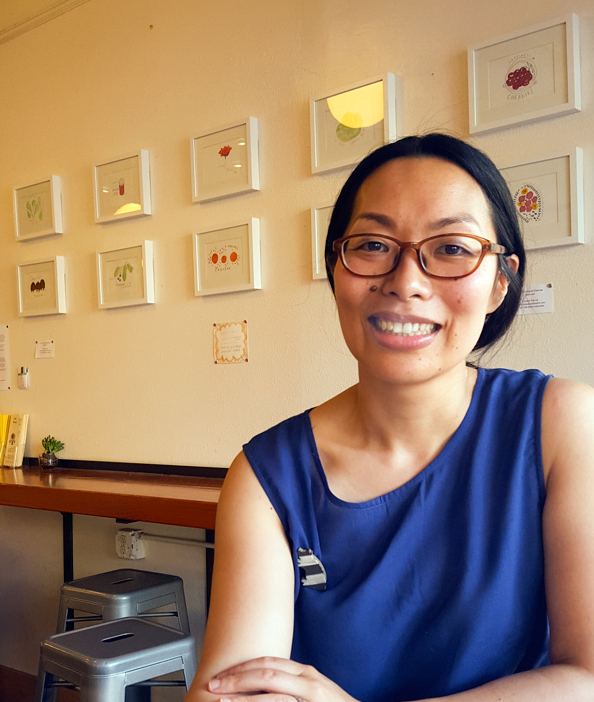 I also showed them to the owner of Geraldine’s Counter, one of the best diners in Seattle :), and he’s agreed to show my work there during the month of October. 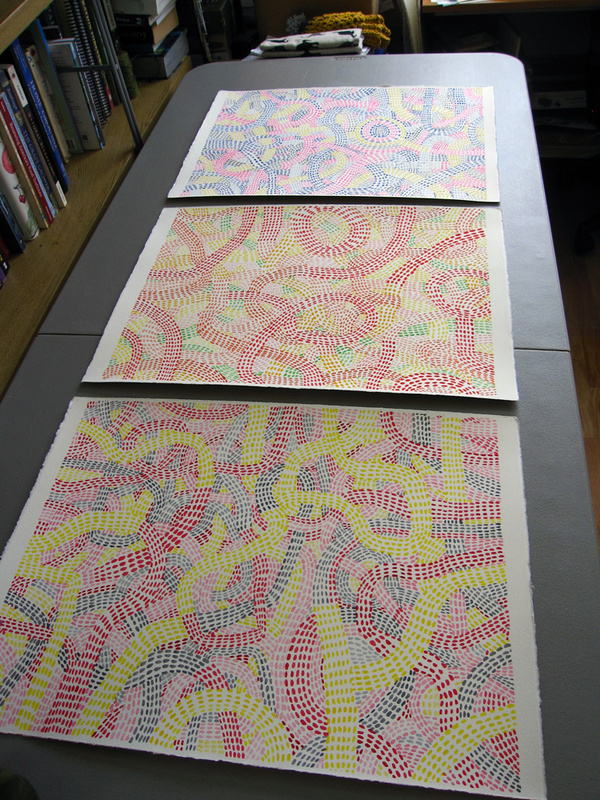 I managed to finish 8 pieces to show. 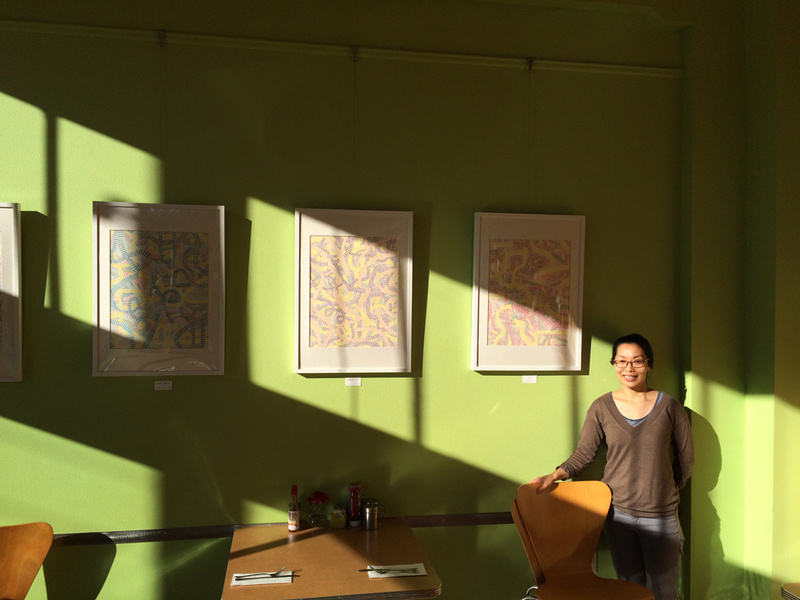 And here is me and a few of my artwork! 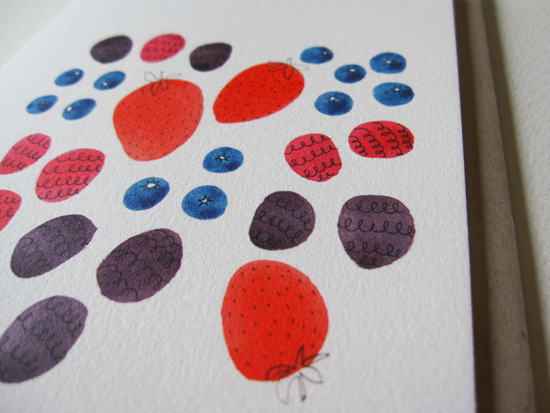 I can also turn these new paintings into postcards, prints, phone cases etc. not to mention selling the originals. 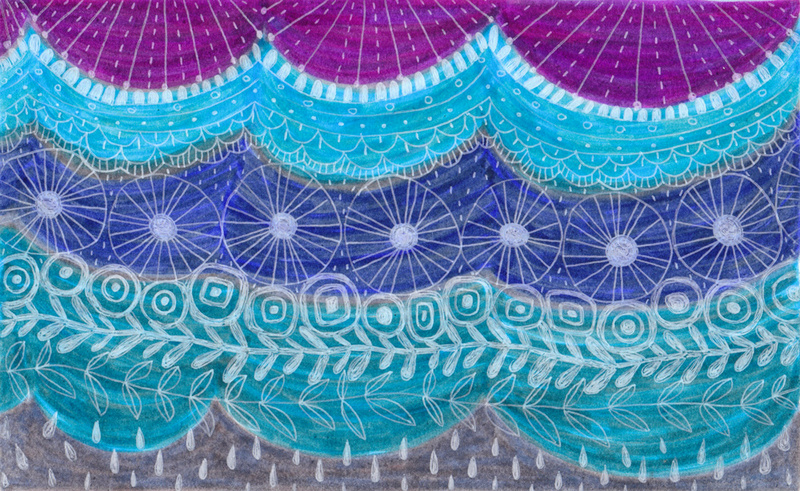 Possible multiple income streams from artwork that came out of fun doodle projects! I like drawing with sumi ink and brush. Like so many other Japanese kids who grew up in Japan, I took Japanese calligraphy lessons every week. Having a nice handwriting is highly valued over there. We’d sit up straight on a little cushion on the floor and practice writing on a rice paper with a brush dipped in sumi ink. I took an art class a couple of years ago, and in one of the classes, we drew with sumi ink and brush. That was so much fun! I thought sumi ink was for serious writing only. But no, you can also be free and fun. 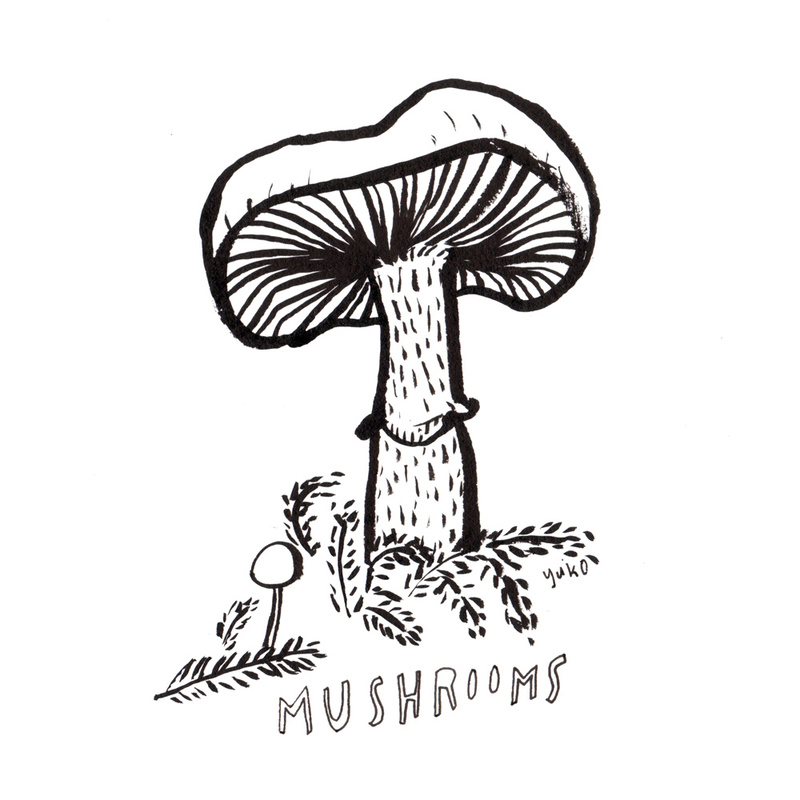 Anyway, I started incorporating sumi ink in doodles and casual sketches too. I just love how rich the black is. And the smell reminds me of the quietness in calligraphy lessons and my childhood in Japan. 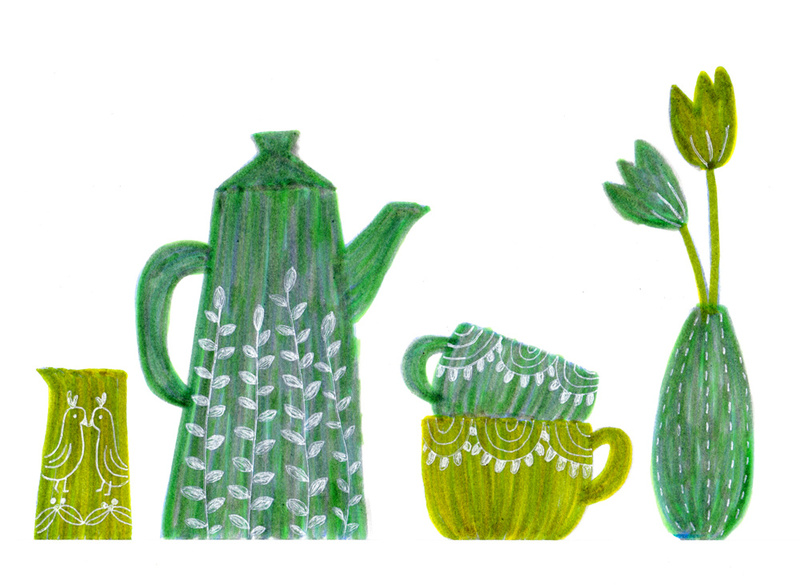 One day I was doodling teacups and teapots in sumi ink. 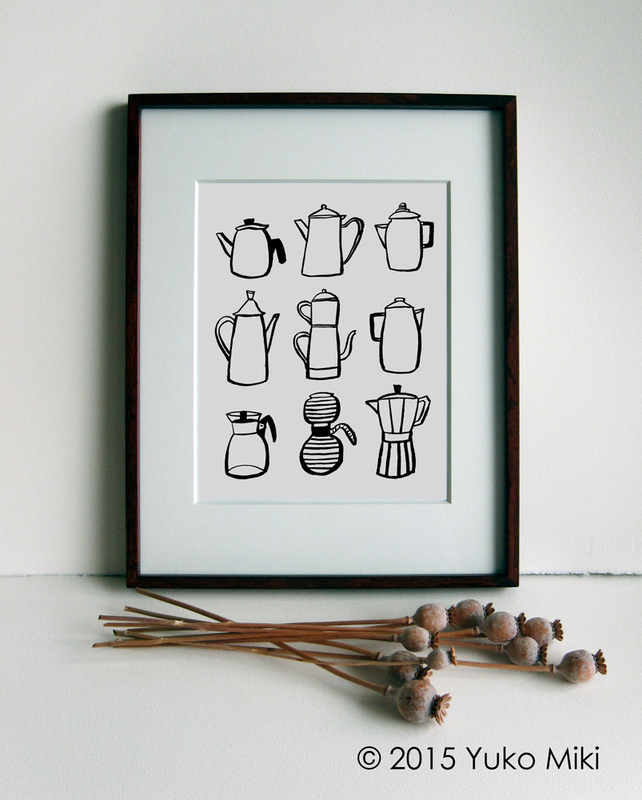 I just like drawing everyday things and wanted to see how they’d look as ink drawings. 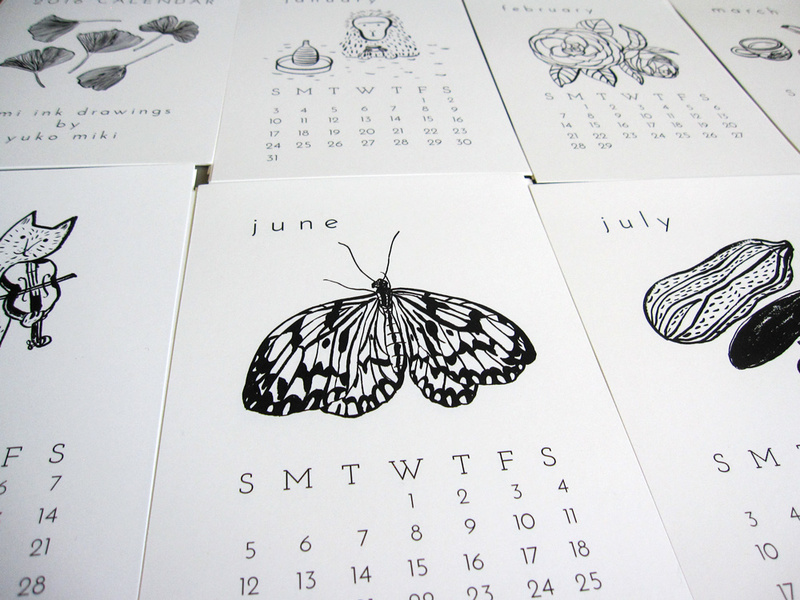 Well, I loved how they turned out so much that I sent them to the print shop right away! 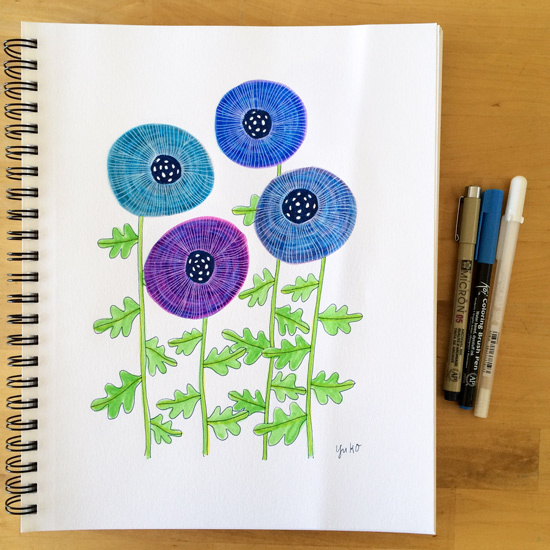 Some of you know that I participated in the August sketch challenge with Janine Crum #makewithme – I’d receive a prompt for a drawing every morning and would share it with the community. On day 5, I had this brilliant idea of starting a sketch in sumi ink for the rest of August. 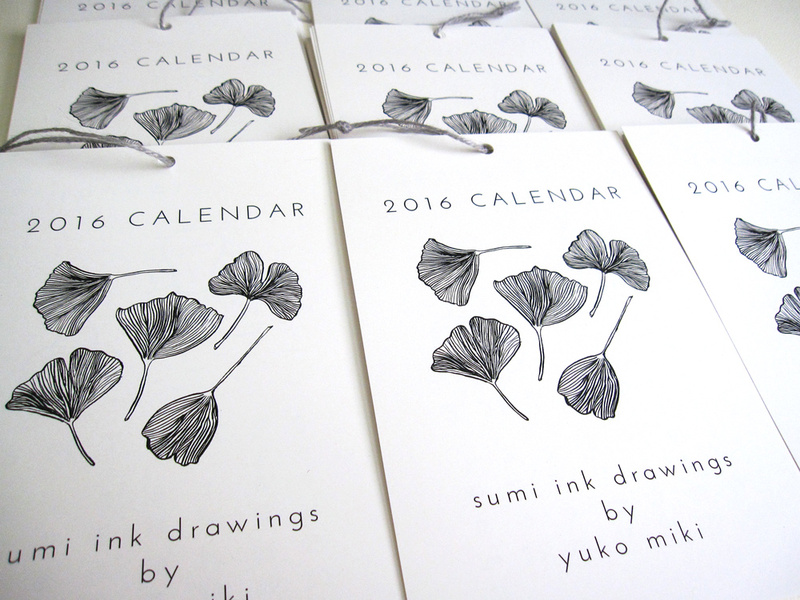 As I was looking at my growing sumi drawing collection, I thought, why not turn them into a calendar!? I’ve been wanting to do a calendar for a while, so it was perfect! 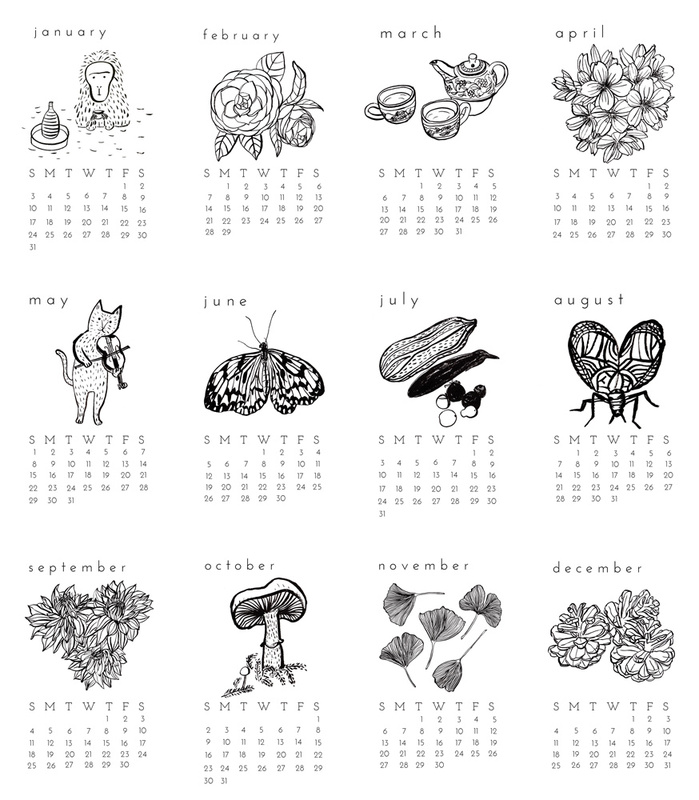 I’ve created several new drawings to add to it, and my 2016 calendar is available on my Etsy shop! 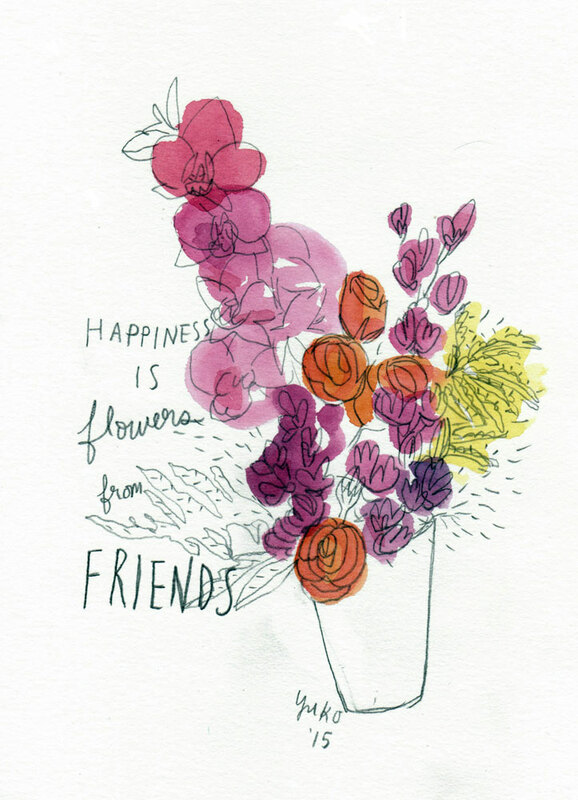 Flowers and plants are my most favorite subjects to draw. They’re so perfect and break my heart a little bit. They’re my go-to motifs when I don’t want to think too much about what to doodle. See how creative play time isn’t just for play? When you work as an artist, there is no clear boundary between work and play. When you create art for yourself or just for fun, it’s still helping your art practice and professional growth, too. 1) I use sketchbooks that are good quality but not very expensive. 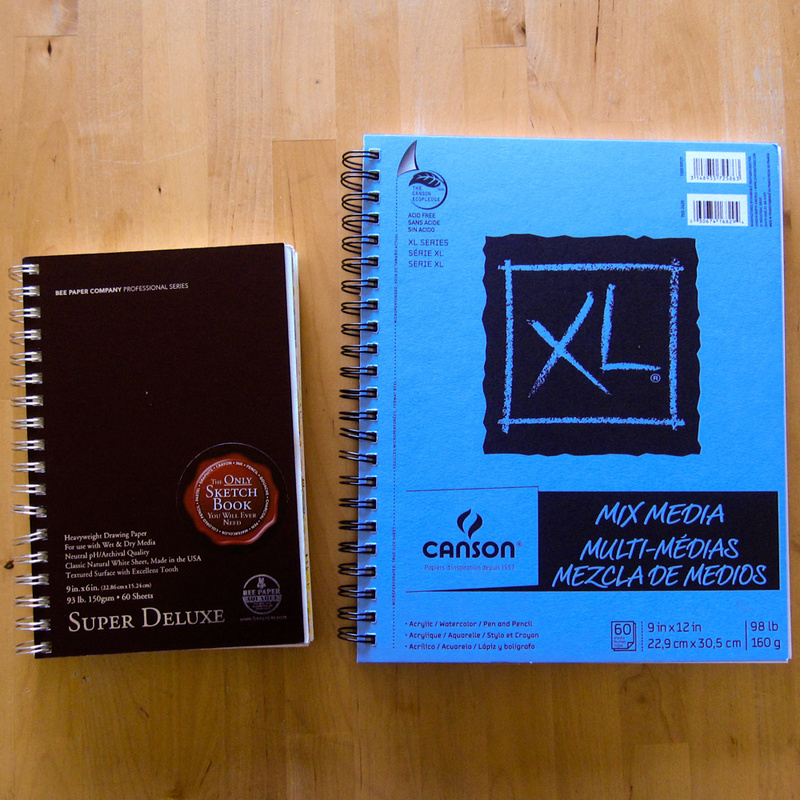 My favorite is Bee Paper Company Super Deluxe Sketchbook (6×9), and Canson Mix Media Sketchbook (9×12) for everyday drawing. I know if I use more expensive sketchbooks, my doodling experience will be more precious, and I really want to keep it as casual and accessible as possible. Also, smaller sized sketchbook is good for carrying around when you’re out and about. You fill up the page pretty quickly, too, so that’s satisfying when you don’t have a lot of time. 2) I have drawing materials that are portable and easy to use. If you’re not a daily painter, just a thought of setting up to paint may deter you from having a daily doodle practice. Except for sumi drawing and my serious watercolor painting, I use pens and markers a lot. My favorite is Micron pens for line drawings and lettering, and Koi brush pens and Gellyroll pens for coloring (They’re from Sakura of America). I also have a stackable watercolor discs (don’t know who makes them but you can get it at many art stores) and water brush pen from Pentel and love them! I conveniently have the photo of everything I’m talking about! They’re handy for carrying along with my small sketchbook, too, when I’m out and about. You knew this was coming, right? Doodling is art practice! Incorporate it in your daily life. My favorite time to doodle is when my husband and I watch shows on Netflix after dinner. I also find pocket of time, like while I’m waiting for a friend at a coffee shop, to doodle. Many artist have a daily practice when they get up in the morning, like August Wren, who does beautiful 30 minute painting every day! If you need extra inspiration for creating time for a daily practice, read my previous post on this very topic! Just put the pen to the paper and see what happens. Draw lines and shapes! Layer a bunch of different colors! Some people experiment drawing with their non-dominant hand. Don’t have a sketchbook? Just draw on a scratch paper. Or add something new to your old drawings! Possibilities are truly endless. And I have a special blog post coming this week that may help you get started! 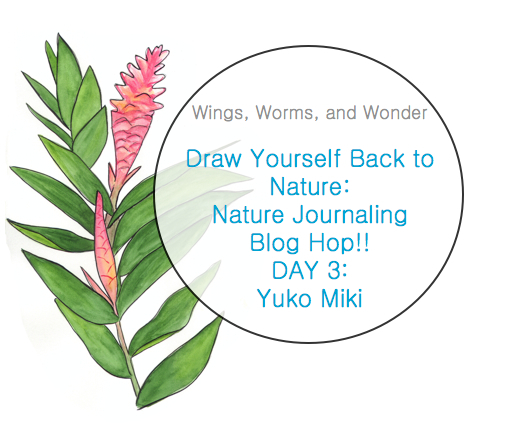 I’m participating in a Draw Yourself Back to Nature Blog Hop this coming week with Kelly from Wings, Worms, and Wonder! What that means is, from Monday 10/5 through Friday 10/10 Kelly and other artists will create a special blog post and give nature drawing tutorials. OK, I have to be honest with you. This was a tough post to write. But I wanted to be open and vulnerable with you. Here is a peek into a not-so-happy side of my daily happiness project. 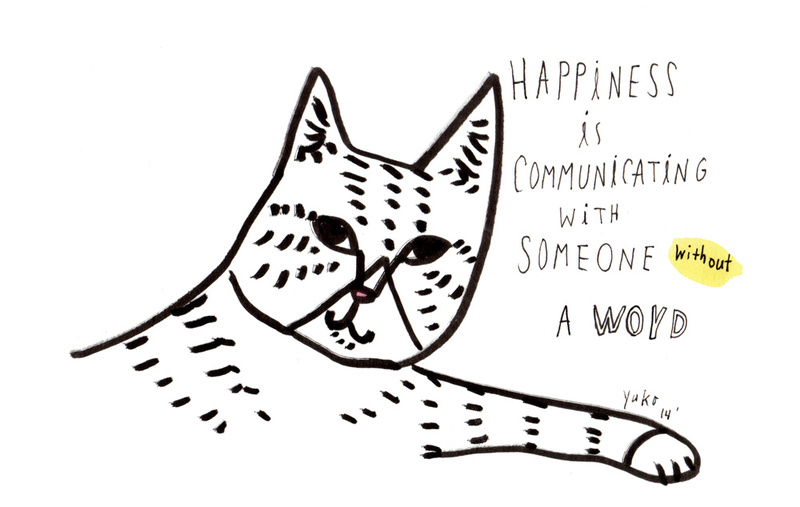 When I set out to start my 365 day Happiness is project, I didn’t think too much about how it was going to go. I just wanted to start and see what happened, which is totally outside of my comfort zone. Generally, I’m a planner and a prefer-not-to-take-a-risk-er. I didn’t know what I would do if I had days when I was overcome by sadness and grief. Could I find something to feel happy about then? That day came unexpectedly in January when our dear kitty Lulu had complications from her diabetes and got really sick. She was suffering and we decided to put her to sleep a couple of days later. She was really loving and brave till the last moment, and it still makes me cry when I think about that day. I had her for about 12 years since she was a tiny itty bitty kitten. 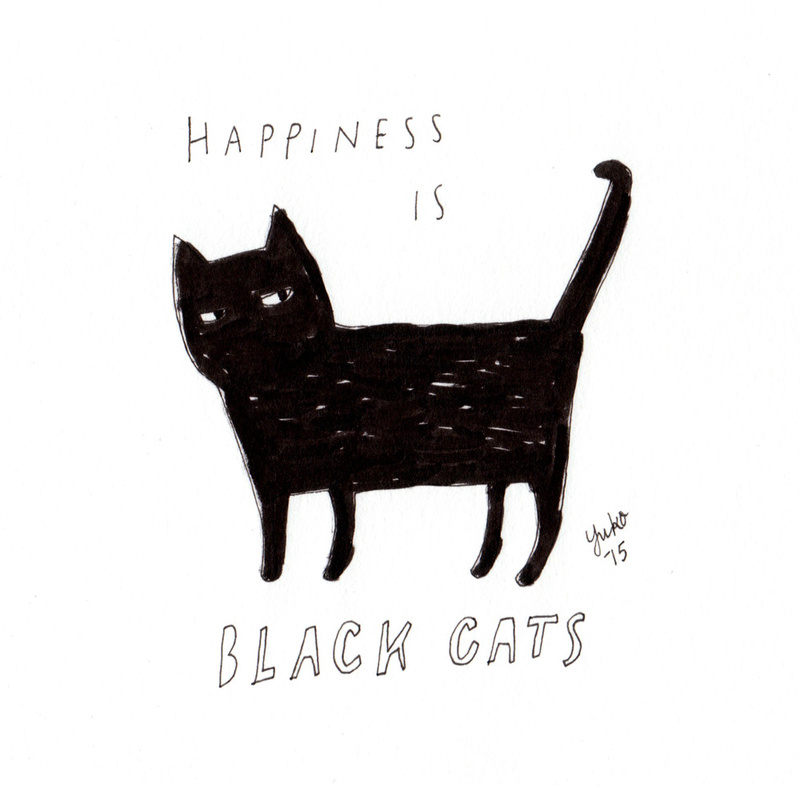 I loved and adored cats ever since I was little, but my parents wouldn’t let me have cats. 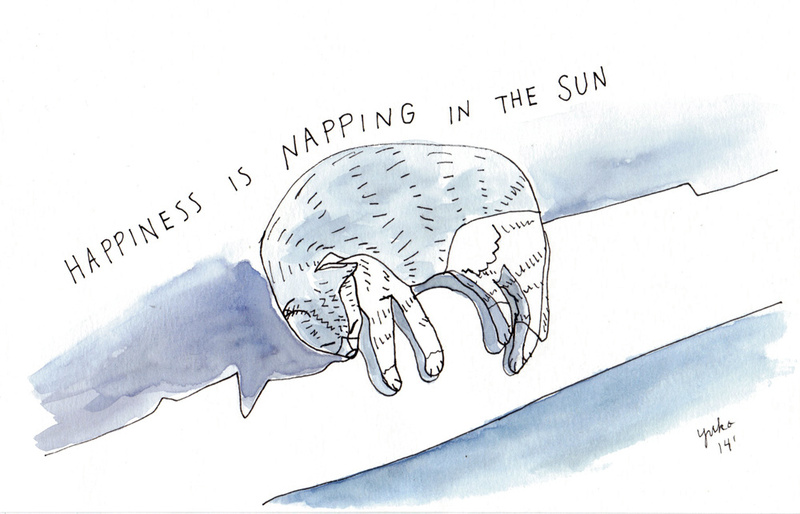 I daydreamed of having cats pretty much 24/7. So I was ecstatic when I got my own kitties as an adult. Lulu and her brother Shepherd, a.k.a. Sheppie, had been like my babies. The connections you build with your animal friends are so special. It’s based on love and trust you develop through actions. There is no explaining your bad mood or tears. They don’t take it personally. They just want to love you and be loved. 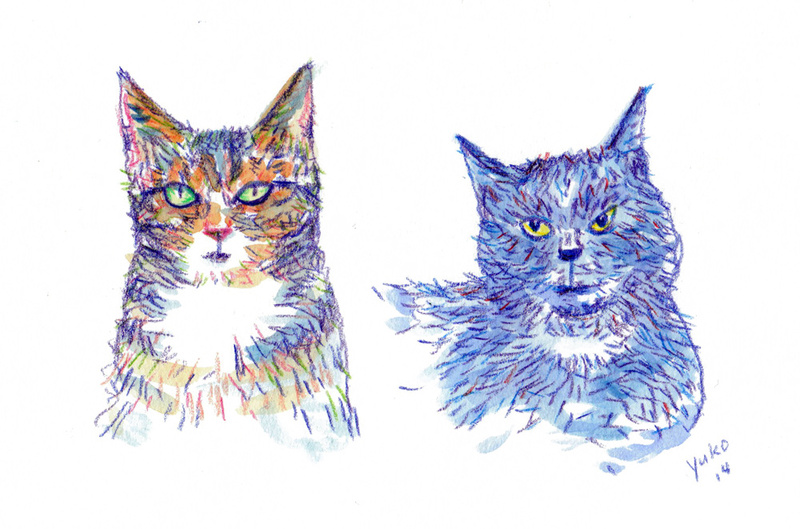 They had been there for me through many life changes, just purring away, beaming love rays at me. It was the saddest day of my life. It hurt so bad. Worse than bad break-ups or losing some of my human family members (I’m just being real here). It felt like I had a giant kitty-shaped hole in my heart, and I didn’t know if it was going to heal. 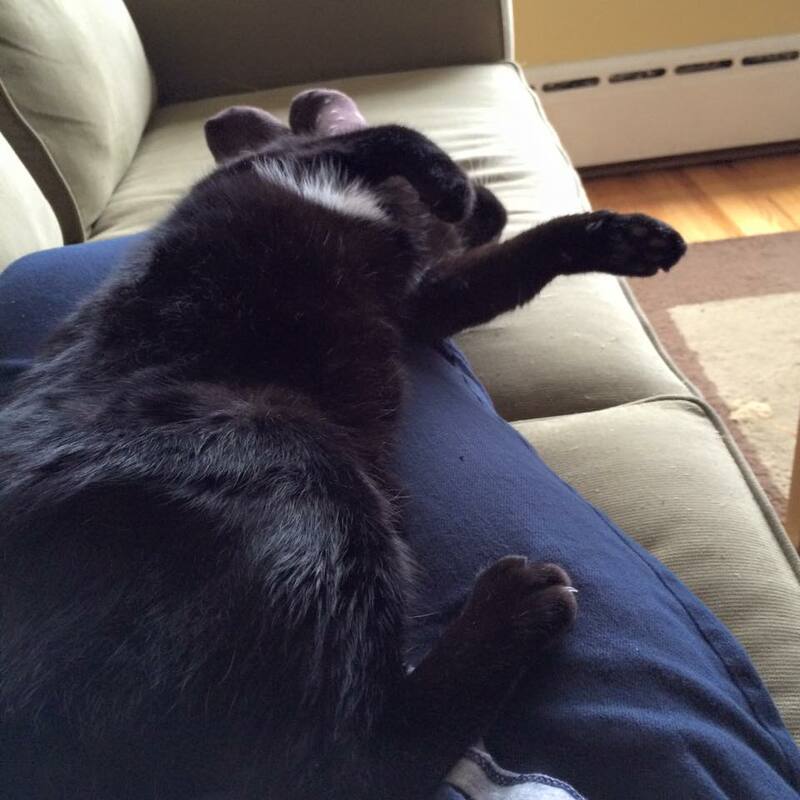 I could no longer feel the warmth of her fur or hear her soft purr as she slept. What do you do with your daily creative commitment when you have such a loss in your life? When all I could think of was how empty it felt to not have her in this world any more? Of course, I could’ve taken a break. That would’ve been totally OK. I thought about it and yet found myself drawing in my sketchbook that night, and the next day, and the day after that. I had never used art as a tool for healing before, at least knowingly. But I can tell you that my pain would’ve been much worse if I hadn’t followed my creative practice during my time of grief. 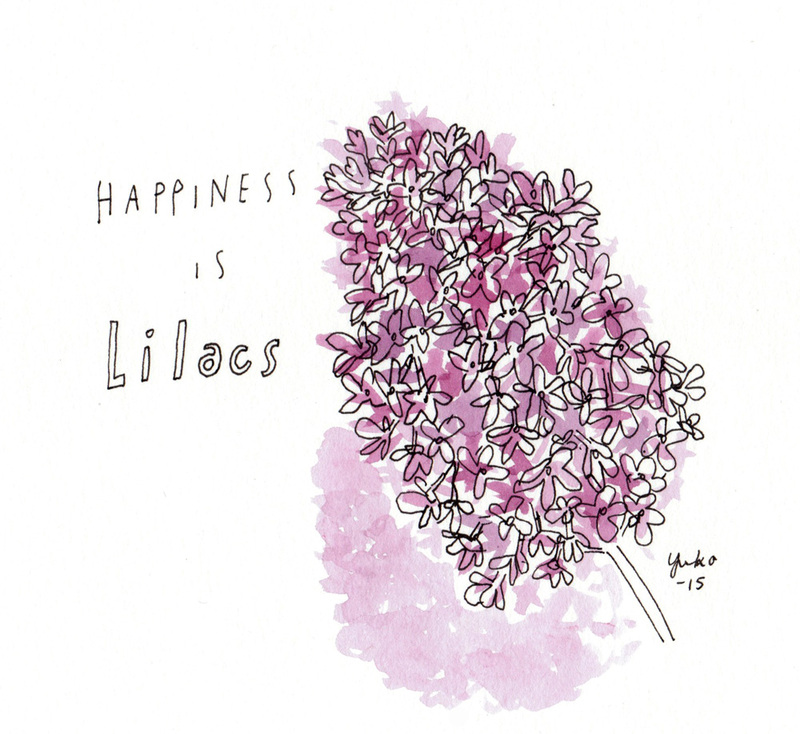 It took my focus off of the sadness even for a little bit while I was drawing about happiness. It created a tiny buffer between me and my grief. While I was overcome by sadness, I searched for anything I felt grateful for. In my search for happiness, I found tremendous amount of love and support that surrounded us. There was no judgement of “oh, it was just a cat.” Friends brought flowers, cards, and treats. There were many hugs and tears. My husband, Dave, stayed very strong for me throughout it all even though he was also very sad. He totally saved me. Every day that passed by, my heart got a little lighter. 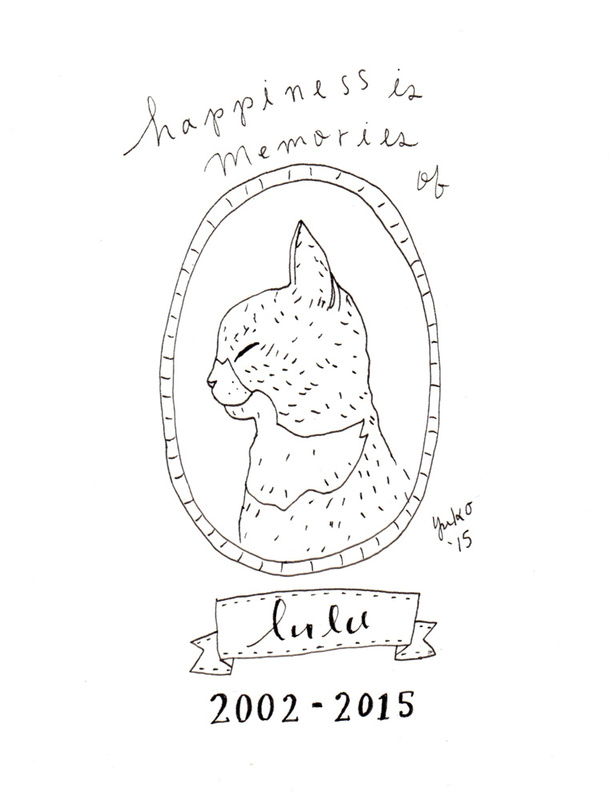 I began to remember fun memories of Lulu and not just her last days. 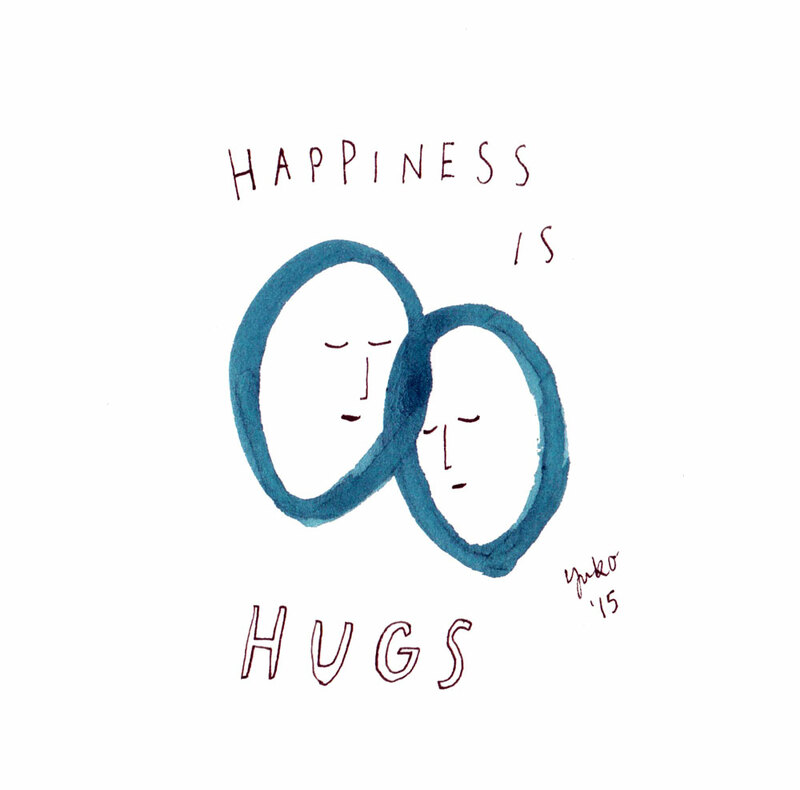 My daily happiness practice helped me appreciate what I have in the face of loss and grief. It also helped me celebrate what I had that was no longer here. Life is never 100% wonderful or terrible. Some days bring more happiness than others. Choosing happiness every day doesn’t make your problems go away but can create a small buffer in your mind so you can face them a bit more calmly. In case you’re wondering, her brother Sheppie is doing just fine as an only cat of the house. He’ll most likely remain as the only kitty of the house for the remainder of his time. On a side note, my therapist recommended a book called Cat Heaven to me when I was talking to her about my loss, and boy, this is a wonderful book. It’s meant to be a kids’ book but is good for adults too. They have one for dogs, too, called Dog Heaven. I haven’t read it yet but am sure it’s also good. 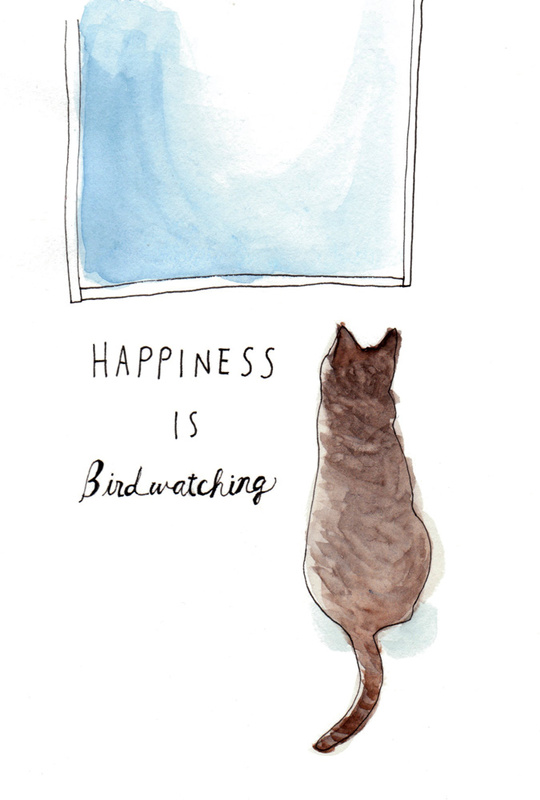 The illustrations are so sweet and comforting. I guarantee this book will make you cry like a baby, so choose a good time and place to read it! 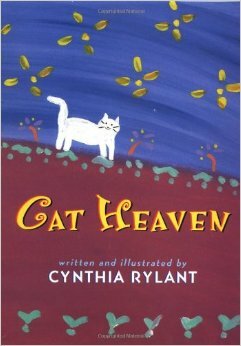 I recommend it to anyone who is mourning a loss of a dog or cat friend. Ok friends, I will see you next Sunday! 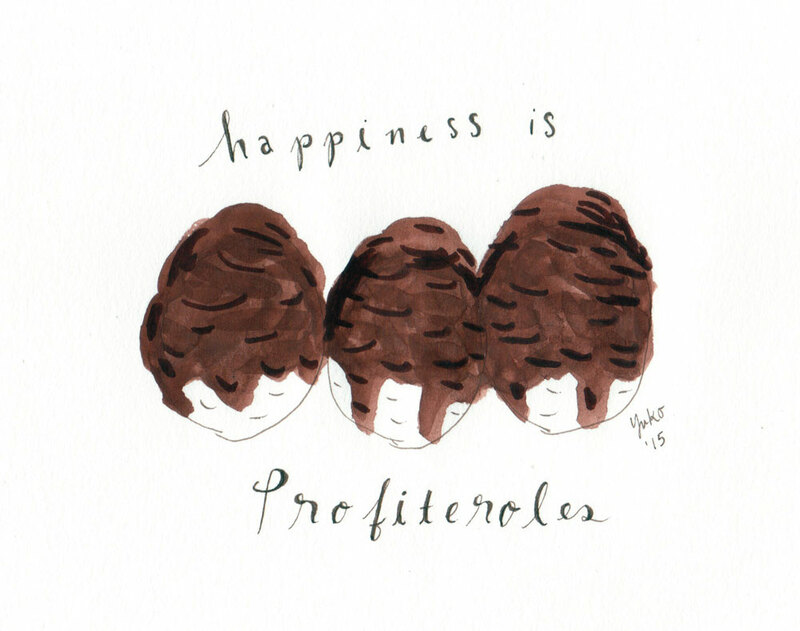 I’m going to continue with my Happiness Project Reflection series. Next post is about finding your motivation when you’re not inspired to create.